This an updated guidelines for the diagnosis and management of asthma, developed by the Saudi Initiative for Asthma (SINA) group, a subsidiary of the Saudi Thoracic Society. The main objective of SINA is to have updated guidelines, which are simple to understand and easy to use by non-asthma specialists, including primary care and general practice physicians. This new version includes updates of acute and chronic asthma management, with more emphasis on the use of Asthma Control Test in the management of asthma, and a new section on "difficult-to-treat asthma." Further, the section on asthma in children was re-written to cover different aspects in this age group. The SINA panel is a group of Saudi experts with well-respected academic backgrounds and experience in the field of asthma. The guidelines are formatted based on the available evidence, local literature, and the current situation in Saudi Arabia. There was an emphasis on patient-doctor partnership in the management that also includes a self-management plan. The approach adopted by the SINA group is mainly based on disease control as it is the ultimate goal of treatment. Asthma is a common chronic disorder of the airways, characterized by variable reversible and recurring symptoms related to airflow obstruction, bronchial hyper-responsiveness, and underlying inflammation. It is one of the most common chronic diseases in Saudi Arabia, affecting more than 2 million Saudis. Its impact is manifested in patients, their families, and the community as a whole in terms of lost work and school days, poor quality of life, frequent emergency department visits, hospitalizations, and deaths. 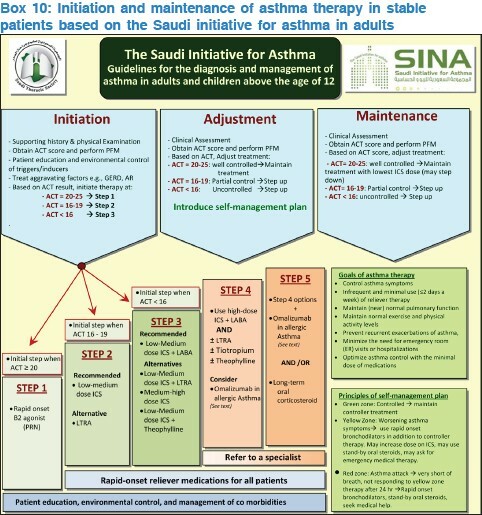 ,, As part of the commitment of the Saudi Thoracic Society (STS) toward a long-term enhancement plan for promoting best practice in asthma management, the Saudi Initiative for Asthma (SINA) was developed in 2009. SINA aimed to have updated guidelines, which are simple to understand and easy to use by non-asthma specialists, including primary care and general practice physicians. Since the implementation of SINA, the authors have realized that there is the need to update the guidelines with special emphasis on new evidence, easy-to-use charts, with a new section on difficult-to-treat asthma (DTA), and more information related to asthma in children. The updated guidelines followed the same methodology as the original guidelines. Al-Fryh et al. investigated the changing prevalence of asthma in the KSA. Two populations of school children of age group between 8 and 16 years were studied using an internationally designed protocol in 1986 and 1995. Comparison of the data of Riyadh versus Hail (an inland desert with dry environment) and Jeddah versus Gizan (a coastal humid environment) revealed that the prevalence of asthma in similar populations increased significantly from 8% in 1986 to 23% in 1995. The study also revealed that there was increased exposure to environmental factors such as tobacco smoke and indoor animals in Saudi houses, which can also play a role. Other studies in the KSA compared the prevalence of physician-diagnosed asthma among Saudi school boys in Yanbu, an industrial city, to two non-industrial villages in a cross-sectional study. The prevalence in Yanbu and in the villages of Al-Furash and Al-Gafure was 13.9% and 8%, respectively. Hijazi et al. conducted a study of 1020 urban and 424 rural children aged 12 years. They attempted to compare the prevalence of allergic symptoms among those living in urban and rural areas of the KSA and to investigate factors associated with any differences found. The prevalence of allergic symptoms was found to be significantly greater among urban children than the rural ones and was more among Saudi children than non-Saudi children. Males were more susceptible to have certain respiratory symptoms and females had more eye and skin symptoms. The educational level and occupation of the father did not influence the likelihood of having symptoms. A study by Al-Kabbaa et al. found that 39% of primary care physicians meet the standards of the national guidelines in management of asthma. However, the overall level of awareness among physicians was low (52%). Their proficiency in general knowledge, diagnosis, classification of severity, and management was also low. Structural airway changes may develop even before the disease becomes symptomatic. They can also occur in patients with allergic rhinitis, who are associated with an increased risk of developing asthma. The most prominent changes include epithelial damage, subepithelial fibrosis, increased airway vasculature, increases in extracellular matrix proteins including collagens and proteoglycans, and increased smooth muscle mass. The mucus hypersecretion observed in asthma is related to an increase in the number of secretory glands and cells such as goblet cells. These changes are generally attributed to the underlying inflammatory process, although other mechanisms may play a role. It has been proposed that remodeling may be involved in the development and persistence of asthma, in the accelerated decline in pulmonary function, and in the development of a more "fixed" component of airway obstruction in some asthmatic patients, particularly severe asthmatics. Although a relationship has been found between the severity of asthma and some of the components of airway remodeling, researchers have not yet been able to adequately distinguish severe asthma from milder forms on the basis of histological features alone. Prevention of airway remodeling has not been well studied, but it is possible that sustained treatment with anti-inflammatory medications as well as the prevention of exacerbations may have a role in preventing or delaying airway remodeling. Evidence Category D: SINA panel consensus judgment. This category is only used in cases where the provision of some guidance was deemed valuable, but the clinical literature addressing the subject was insufficient to justify placement in one of the other categories. The task was divided among three groups that covered chronic asthma in adults, acute asthma in adults, and asthma in children. Each section was internally reviewed by at least two other members. The SINA panel conducted round-table discussions frequently and jointly reviewed it. A panel of international experts reviewed the guidelines and their recommendations were thoughtfully considered. The expected outcome will lead to safe high-quality patient care. Physical examination may reveal bilateral expiratory wheezing, which may be absent between exacerbations. Examination of the upper airways is important to look for evidence of allergic rhinitis, such as mucosal swelling, nasal polyps, and postnasal dripping. Other allergic manifestations, such as atopic dermatitis and/or eczema, also support the diagnosis of allergic asthma. The presence of localized wheeze, crackles, stridor, clubbing, or heart murmurs should suggest alternative diagnoses. , Therefore, there should be a careful consideration of any possible alternative diagnoses prior to commencing asthma treatment by a physician. The objective of asthma treatment is to achieve and maintain control of the disease. Medications used to treat asthma can be classified as controllers or relievers. Controllers are medications taken daily on a long-term basis to keep asthma under clinical control mainly through their anti-inflammatory effects. Relievers are medications used on an "as-needed basis" that act quickly to reverse bronchoconstriction and relieve symptoms. Inhaled corticosteroids (ICS) are currently the most effective anti-inflammatory medications for the treatment of asthma. , They reduce symptoms, improve quality of life, improve lung function, decrease AH, control airway inflammation, reduce frequency and severity of exacerbations, and reduce asthma mortality. When they are discontinued, deterioration of clinical control follows within weeks to months in most patients. ICS differ in their potency and bioavailability. Most of the benefits from ICS are achieved in adults at relatively low doses [Boxes 5 and 6]. As tobacco smoking reduces the responsiveness to ICS, higher doses may be required in patients who smoke. To reach control, add-on therapy with another class of controller is preferred to increasing the dose of ICS; however, some patients with severe asthma may benefit from long-term treatments with high doses of ICS. , The clinical benefits of intermittent systemic corticosteroids or ICS for children with infrequent viral-induced wheezes remain controversial. While some studies in older children have found small benefits, a study in young children found no effects on wheezing symptoms. There is no evidence to support the use of low-dose maintenance inhaled ICS for preventing transient wheezing in childhood. Though low-medium dose ICS may affect growth, this effect is clinically insignificant and may be reversible. ICS are generally safe and well tolerated. Local adverse effects can occur and include oropharyngeal candidiasis and dysphonia. With metered dose inhalers (MDI), these effects may be reduced by using spacer devices. Mouth washing after inhalation may reduce oral candidiasis. Systemic side effects are occasionally reported with high doses and long-term treatment. The small risk of adverse events from the use of ICS is well balanced by their efficacy. Some studies have shown that ciclesonide has relatively lower local and systemic side effects. To date, ciclesonide has not been approved for children by the Food and Drug Administration (FDA); its safety and effectiveness have not been established in children below 12 years. Leukotriene modifier agents [leukotriene receptor antagonists (LTRAs)] reduce airway inflammation and improve asthma symptoms and lung function, but with a less consistent effect on exacerbations, especially when compared to ICS. They may be used as an alternative treatment to ICS for patients with mild asthma, especially in those who have clinical rhinitis. Some patients with aspirin-sensitive asthma respond well to the LTRA. However, when used alone as a controller, their effects are generally less than that of low-dose ICS. When added to ICS, LTRA may reduce the dose of ICS required by patients with uncontrolled asthma and may improve asthma control. , LTRA are generally well tolerated. In children, studies have shown that LTRA may be useful for reducing the number of exacerbations induced by viruses and for reducing bronchial inflammation in atopic children. ,,, There are no clinical data to support their use under the age of 6 months. Theophylline is a weak bronchodilator with modest anti-inflammatory properties. It may provide benefits as an add-on therapy in patients who do not achieve control with ICS alone, but is less effective than LABA and LTRA. Theophylline is not recommended for use as monotherapy in asthma treatment. Recent data have shown that low-dose theophylline may have an important role in improving steroid resistance in patients with severe asthma requiring high-dose ICS through activation of certain down-regulated pathways, such as histone deactylases. , Their side effects include gastrointestinal symptoms, cardiac arrhythmias, seizures, and even death. Nausea and vomiting are the early symptoms of toxicity. Liver disease, congestive heart failure (CHF), some quinolones, and some macrolides increase the risk of toxicity. Use of lower doses may decrease the side effects. The side effect profile is much higher than that of inhaled B2-agonists. Therefore, their use is highly discouraged. Oral route is not recommended in children. Long-term oral glucocorticosteroid therapy (excluding short courses for acute attacks of asthma for a period of 1-2 weeks) may be required to control difficult asthma despite maximum standard therapy. The dose should be reduced to the lowest possible and other controllers should be maximized to minimize the side effects. Its use is limited by the risk of significant adverse effects. Use of intramuscular long-acting steroids is highly discouraged because of the increased risk of side effects. The side effects include: osteoporosis, hypertension, diabetes, adrenal insufficiency, obesity, cataracts, glaucoma, skin thinning, and muscle weakness. Withdrawal can elicit adrenal failure. In patients prescribed long-term systemic corticosteroids, prophylactic treatment for osteoporosis should be considered. Relievers are medications used on an as-needed basis that act quickly to reverse bronchoconstriction and relieve symptoms. SABA, such as salbutamol, are the medications of choice for relief of symptoms of acute exacerbations of asthma and for the pretreatment of exercise-induced bronchoconstriction. The MDI with chamber is as effective as the nebulized route in treatment of acute episodes of wheeze in children. Formoterol is not currently available in the market as a single inhaler; however, it can be used for symptom relief because of its rapid onset of action. When it is used for maintenance therapy, it should always be given with ICS. Regular, long-term use of SABA is not recommended. There is no evidence supporting the routine use of theophylline in treating acute asthma and its use is discouraged. It is the most popular for patients and clinicians. Small-volume nebulizers (SVNs) are predominately powered by a compressed gas (air or oxygen) to convert one or more than one drug solutions or suspensions at any concentrations and dose into aerosols. One of its main advantages is that it requires minimal patient cooperation and is therefore suitable for all ages, with normal breathing and no inspiratory pause required. One of its main disadvantages is importability and time to deliver the medication (10-25 min), in addition to the potential of contamination. It is a pre-pressurized inhaler with medication and a propellant, which when actuated will give one dose of the drug for a single inspiration. pMDIs typically require slow inspiratory flow (<30 L/min). One of its main advantages is that it is premixed and the ability to provide multiple doses in a short period of time. It is also small and portable with limited contamination. Disadvantages include the need of patient training to coordinate inhalation with actuation, and if this not done properly, there is a potential of high deposition of drug in the oropharynx. Also, because it does not have dose counter, it is difficult to determine the dose remaining in the canister. Compared to the older chlorofluorocarbon (CFC) propellant formulations, hydrofluroalkane (HFA) formulations provide smaller particle size aerosols with less oral deposition, hence less oral side effects and greater proportion of lung deposition. It is not pressurized (no propellant), and therefore requires high inspiratory flows (60-90 L/min) to disperse a full dose. In addition to its portability, advantages include that it is breath-actuated and there is a built-in dose counter. Disadvantages include an adequate inspiratory flow to disperse a full dose. If not used properly, there is fairly higher oropharyngeal impaction and exhaled humidity into mouthpiece would affect the function of the device. Therefore, it may not be suitable for very young or very old patients. The commonly available devices in Saudi Arabia are the Turbo-haler, Diskus, and Handihaler devices. HFA formulations provide smaller particle size aerosols with less oral deposition, hence less oral side effects and greater proportion of lung deposition than the older CFC propellant formulations. The long-term goal of asthma therapy is to achieve and maintain asthma control by utilizing pharmacological and non-pharmacological measures [Box 7]. This should lead to utilization of the least possible dose of medications in order to minimize the risk of side effects. 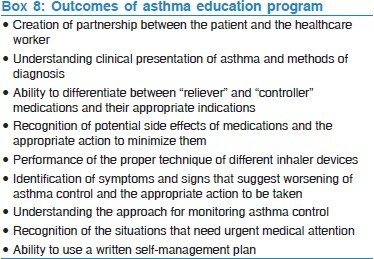 The goal of asthma education is to provide a patient with asthma (or the parents of a child with asthma) adequate training to enhance their knowledge and skills to be able to adjust treatment according to guided self-management (Evidence A). ,,,, In order to enhance the level of knowledge and skills among asthmatics, education should include knowledge about asthma and skills related to the devices, as there might be misperceptions about the use of inhalers and the safety of ICS. ,, Asthma education should be conducted by a well-trained healthcare worker with good communication skills, who is able to create an interactive dialog in a friendly environment. With the availability of appropriate information, patients will be encouraged to continue on the management plan and reassured about the control of the disease. It is essential to get the feedback from the patient in order to maintain a bidirectional rapport and an optimum environment. It has been documented that a well-structured asthma education program will improve quality of life, reduce cost, and the utilization of healthcare resources. ,, Asthma education should be tailored based on the available setting [Box 8]. It is considered an integral part of asthma management for patients and doctors. It helps to recognize the loss of control of asthma and gives clear instructions for early intervention to prevent asthma attacks. The use of an asthma action plan leads to better control in both children and adults. The asthma action plan may be based on symptoms or PEF measurements [Box 9]. Regular review of the asthma action plan is important as a person's level of asthma control may change over time. If a patient has an exacerbation, the patient should be assessed if he/she has effectively used their action plan. Measures to prevent or reduce exposure to risk factors should be implemented wherever possible. There are different triggers leading to asthma exacerbations, which may include: allergens, viral infections, pollutants, drugs, and occupational agents. These factors can be classified as indoor or outdoor allergens and occupational sensitizers. Indoor allergens and air pollutants: There is a wide spectrum of indoor allergens that includes domestic mites, furred animals, cockroaches, and fungi. , Most of the interventions to reduce exposure to these triggers will enhance the asthma control. The most important indoor air pollutant is related to tobacco exposure. Measures to avoid tobacco exposure will lead to better asthma control and avoidance of long-term lung function impairment. Occupational exposures: Whenever an occupational sensitizer is identified, it is advisable to keep the affected person away from that environment. The earlier the removal of this sensitizer takes place, the higher the chance of complete recovery from occupational asthma. Food and drugs: Food and food additives are uncommon triggers of asthma. Avoidance cannot be recommended until it is documented by a specialist. However, certain drugs whenever identified should be avoided (e.g. beta blockers). The consensus among SINA panel is to simplify the approach to initiate asthma therapy by using the ACT score [Box 10]. A score of ≥20 will lead to initiating treatment at step 1, 16-19 at step 2, and less than 16 at step 3 (Evidence B). An alternative to this approach is the GINA approach that recommends initial treatment at step 2 for patients who are currently not taking long-term controller medications. If the initial symptoms are more frequent, treatment is recommended at step 3. Nevertheless, some patients have few symptoms when on SABA and an "as-needed basis" is enough. It should be noted that patients often underestimate the presence of asthma symptoms and also tend to assume their asthma is controlled when this is not the case. A stepwise approach to therapy is used to achieve asthma control. 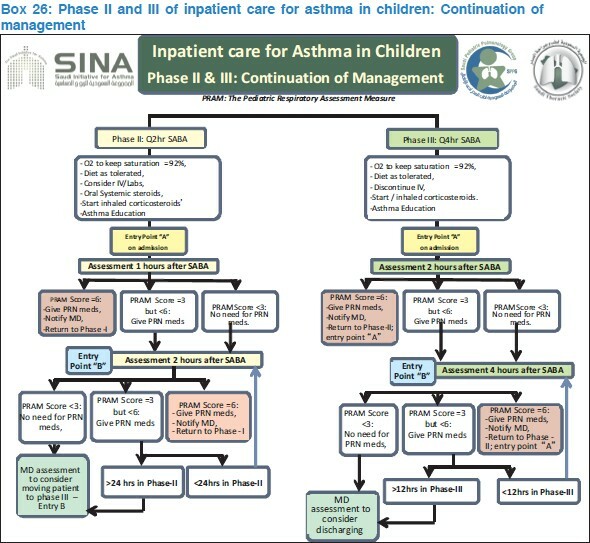 The steps (1-5) of care for managing asthma are shown in Box 10. Therapy is stepped up to achieve control, and stepped down for patients who have maintained control for a sufficient length of time. It is important to determine the minimal amount of medications required to maintain control and reduce the risk of side effects. As most asthma patients have concomitant rhinosinusitis that might affect their control, treatment of this condition will improve asthma control (Evidence A). ,,,, This includes nasal steroids, LTRA, and antihistamines. Coexisting sinusitis should be treated appropriately. Reduction in therapy should be gradual and closely monitored based on clinical judgment of the individual patient's response to therapy and the ACT score (Evidence D). If the patient is on ICS as monotherapy, the dose of ICS may be reduced by 25% every 3-6 months to the lowest dose possible that is required to maintain control (Evidence B), , and then changed to single daily dose (Evidence A). It should be clearly explained to the patient that asthma control may deteriorate if treatment is abruptly discontinued. Medications and doses currently taken. Selection of the appropriate device and appropriate prescription of spacer with MDI devices. Occasions when medication is missed per week. Problems and difficulties faced by the patient after taking the medications (e.g. cost, time, lack of perceived need, etc.). Patient's concerns about asthma medications. Possible alternative diagnosis (e.g. presence of crackles in auscultation, restrictive pattern in spirometry, presence of stridor, or vocal cord dysfunction). A possible environmental or occupational exposure. Medication side effects (e.g. beta blockers or nonsteroidal anti-inflammatory agents). Psychosocial problems such as depression. If the above factors are ruled out, a step-up in therapy is recommended. However, in severe cases, a short course of systemic steroid may be indicated to regain asthma control. There is uncertainty regarding the diagnosis. There is difficulty achieving or maintaining control of asthma. Immunotherapy or omalizumab is being considered. The patient requires step 4 care or higher. The patient has had an exacerbation requiring a hospitalization. The recommendations for treatment steps are intended to be general guidelines for assisting, not replacing, clinical decision-making. Who should be treated at step 1? The symptoms are usually mild and infrequent [Box 10]. However, some patients may experience sudden, severe, and life-threatening exacerbations. It is essential to treat these exacerbations accordingly. This category is recommended to follow step 1 by considering SABA to be taken on an "as-needed basis" to treat symptoms (Evidence A). ,, It is usually sufficient therapy for this level. 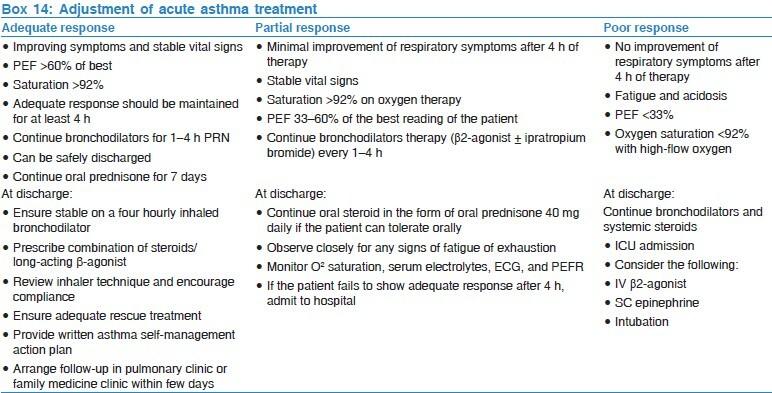 However, if treatment frequency increases to more than 2 days a week, then the patient should be treated as partially controlled asthma (see below). Treat patients who may have seasonal asthma as having uncontrolled asthma during the season and at step 1 for the rest of the year (Evidence D). Patients who had two or more exacerbations requiring oral corticosteroids or hospital admissions in the past year should be treated as patients with uncontrolled asthma, even if the level of control seems to be adequate in between the exacerbations (Evidence D). Adding an LABA to a low-medium dose ICS improves asthma control for patients whose asthma is not controlled on a low-dose ICS alone (Evidence A). ,, These are available in combination devices, such as fluticasone/salmeterol (Seretide) or budesonide/formoterol (Symbicort). There was a recent warning mandate for new safety measures for the use of inhaled LABAs in asthma control. Asthmatics taking inhaled LABAs without inhaled ICS faced an augmented rate of asthma exacerbations, hospitalizations, and death. Based on this evidence, the Saudi FDA withdrew all LABA monotherapy medications from the Saudi market by the end of 2010. Therefore, the SINA panel has limited the use of relievers to SABA. Tiotropium is a long-acting anticholinergic agent approved for the treatment of chronic obstructive pulmonary disease. Recent evidence has shown that when tiotropium is added to ICS, it improves symptoms and lung function in patients with inadequately controlled asthma. Its effect appeared to be at least equivalent to LABA (evidence A). ,, This evidence supports that tiotropium is an alternative to LABA when added to ICS. However, the effect on reducing exacerbations has not been shown. Consultation with a specialist is recommended for patients whenever there is a difficulty in achieving control (Evidence D). Omalizumab may be recommended at this step for patients who have allergic asthma (as determined by skin test or RAST study) that is still uncontrolled (Evidence A). ,, Special knowledge about the drug and its side effects should be available before administering omalizumab by any physician. Therefore, referral to an asthma specialist is mandatory. Consultation with an asthma specialist is considered to be a mandatory recommendation for patients who require this step of therapy (Evidence D). If the patient does not have allergic asthma or omalizumab is not available or not adequately controlling the disease, the alternative approach is to use the lowest possible dose of long-term oral corticosteroids (Evidence D). Use the lowest possible dose to maintain control. Closely monitor the development of corticosteroid-related side effects. When controlled asthma is achieved, continue attempts to reduce the dose of systemic corticosteroids. Maintaining high-dose of ICS therapy may help to reduce the dose of systemic steroid. Adjustment of steroid dose at the time of stress (e.g. infection, exacerbation, surgery, etc.) is essential. Most patients who present with an acute asthma exacerbation have chronic uncontrolled asthma. Many deaths have been reported in patients who have received inadequate treatment or poor education. The following should be carefully checked: p0revious history of near-fatal asthma, whether the patient taking three or more medications, there is heavy use of SABA, repeated visits to emergency department, and brittle asthma. Upon presentation, a patient should be carefully assessed to determine the severity of the acute attack [Box 12] and the type of required treatment. , PEF and pulse oximetry measurements are complementary to history taking and physical examination. This section will start with a review of medications used in acute asthma. This will be followed by acute asthma management. Adequate oxygenation is an essential part of therapy. However, it is important to give a controlled dose of oxygen; a recent paper showed patients who received 28% oxygen did better than those who received 100% oxygen. Oxygen saturations of at least 92% are recommended as the target of treatment. In acute asthma, inhaled salbutamol is the preferred choice. , Repeated doses should be given at 15-30 min intervals or continuous nebulization (salbutamol at 5-10 mg/h) should be used for 1 h if there is an inadequate response to initial treatment. In patients who are able to use the inhaler devices, 6-12 puffs of MDI with a spacer are equivalent to 5 mg of salbutamol by nebulizer. A single dose of IV magnesium sulfate (1-2 g) has been shown to be a safe and effective in acute asthma. In a systematic review, magnesium sulfate has shown to reduce hospitalizations in patients with severe or life-threatening asthma attack that fails to respond to initial treatment. Viral infection is the usual cause of asthma exacerbation and routine use of antibiotics is strongly discouraged. Antibiotics should be used when there is associated pneumonia or bacterial bronchitis. Randomized controlled trials of fluid replacement in acute asthma showed no benefit. Hypokalemia can be caused or exacerbated by β2 agonist and/or steroid treatment and must be corrected. Patients presenting with mild asthma exacerbation are usually treated in an outpatient by stepping up in asthma management, including doubling the dose of ICS. However, some cases may require short course of oral steroid. Patients with moderate asthma exacerbation are clinically stable. They are usually alert and oriented, but may be agitated. They are able to communicate and talk in full sentences. Their respiratory rate is between 25 and 30 per minute and may be using their respiratory accessory muscles. Heart rate is <120/min and blood pressure is normal. A prolonged expiratory wheeze is usually heard clearly over lung fields. Oxygen saturation is usually normal secondary to hyperventilation. The PEF is usually in the range of 50%-75% of predicted or previously documented best. Measurement of arterial blood gases are not routinely required in this category; however, if done, it shows widened alveolar-arterial oxygen gradient and low PaCO 2 , secondary to increased ventilation perfusion mismatch and hyperventilation, respectively. Chest X-ray is not usually required for moderate asthma exacerbation, unless pneumonia is suspected. Patients are usually agitated and unable to complete full sentences. Their respiratory rate is usually >30/min and use accessory muscles. Significant tachycardia (pulse rate >120/min) and hypoxia (SaO 2 <92% on room air or low-flow oxygen) are usually evident. Chest examination reveals prolonged distant wheeze secondary to severe airflow limitation and hyperinflation. The PEF is usually in the range of 33-50% of predicted. When done, arterial blood gases reveal significant hypoxemia and elevated alveolar-arterial O 2 gradient. PaCO 2 may be normal in patients with severe asthma exacerbation. Such finding is an alarming sign, as it indicates fatigue, inadequate ventilation, and pending respiratory failure. Chest radiograph is required if complications, such as pneumothorax, or pneumonia are clinically suspected. Patients with life-threatening asthma are severely breathless and unable to talk. They can present in extreme agitation, confusion, drowsiness, or coma. Unless already in respiratory failure, the patients usually breathe at a respiratory rate >30/min and use their accessory muscle secondary to increased work of breathing. Heart rate is usually >120/min, but at a later stage, patients can be bradycardiac. Arrhythmia is common in this category of patients secondary to hypoxia and ECG monitoring is mandatory. Oxygen saturation is usually low (<90%) and not easily corrected with O 2 . Arterial blood gases are mandatory in this category and usually reveal significant hypoxia and normal or high PaCO 2 . Respiratory acidosis might be present. PEF is usually very low (<33% of the predicted). Chest X-ray is mandatory in life-threatening asthma to rule out complications such as pneumothorax or pneumomediastinum. It is important to realize that some patients might have features from more than one level of acute asthma severity. For the patients' safety, he/she should be classified as the higher level and managed accordingly. oral prednisolone 40 mg daily which could be maintained if patient can tolerate oral intake. Frequent clinical evaluation and serial CXR, electrolytes, BUN, creatinine, glucose, 12-lead ECG, ABGs should be implemented. O 2 saturation >92% on room air. Review and reverse any treatable cause of the exacerbation. Review inhaler technique and encourage compliance. Step up asthma treatment "at least step 3." Prescribe oral steroid for 7-14 days. Ensure adequate PRN rescue treatment. Provide a clearly written asthma self-management action plan. Arrange follow-up appointment within 1 week. Minimal improvement of respiratory symptoms. O 2 saturation >92% on oxygen therapy. PEF between 33% and 60% of predicted. Continue bronchodilator therapy (SABA every 1 h and/or ipratropium bromide every 4 h), unless limited by side effects (significant arrhythmia or severe hypokalemia). oral prednisolone 40 mg daily. Observe closely for any signs of fatigue or exhaustion. Monitor O 2 saturation, serum electrolytes, electrocardiogram (ECG), and and peak expiratory flow meter (PEFR). If the patient fails to show adequate response after 4 h (see above), admit to hospital. No improvement of respiratory symptoms. Altered level of consciousness, drowsiness, or severe agitation. Signs of fatigue or exhaustion. O 2 saturation <92% with high-flow oxygen. ABGs: Respiratory acidosis and/or rising PaCO 2. Deliver continuous nebulization of SABA, unless limited by side effects. IV methylprednisolone 40 mg every 8 h.
Asthma represents the commonest chronic illness of childhood. According to a local survey in Saudi Arabia, the prevalence of asthma in schoolchildren has raised from 8% to 23% between 1986 and 1995. It is also considered a leading cause for childhood morbidity as measured by school absences, emergency department's visits, and hospitalizations. Further, the global cost of asthma goes substantially far beyond mortality and morbidity outcomes to significant socioeconomic burden, especially those related to non-medical costs. From the prospective of both patient and society, the cost of not treating asthma is higher than asthma treatment. 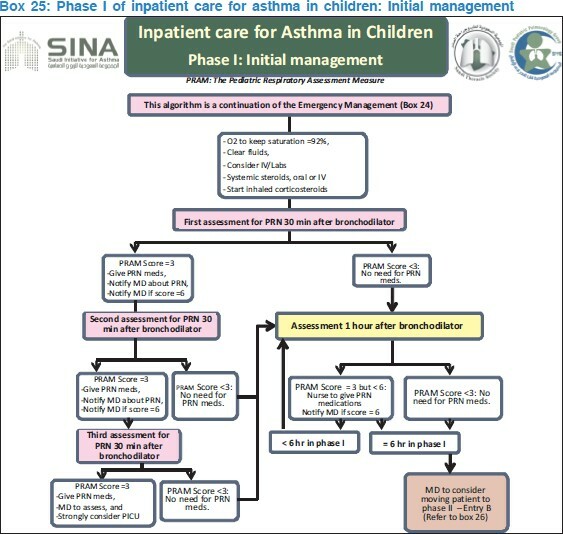 , This section represents the panel views of the Saudi Pediatric Pulmonology Group, a subsidiary of the STS, on asthma management in children. Accurate diagnosis of asthma is crucial to prevent inappropriate management, and morbidities and mortalities. This may result in unnecessary or ineffective treatment due to misdiagnosis or over-diagnosis. , As the diagnosis of asthma in young children is challenging, physicians may solve any uncertainty by utilizing some terms like "reactive airway disease," a terminology that should be discouraged as it can restrain full clinical assessment. , Therefore, asthma diagnosis in children is recommended to be based on a careful clinical assessment [Box 15] that would include recurrent or chronic symptoms related to airway obstruction such as wheezing, coughing, night symptoms, activity limitation, and shortness of breath. These symptoms typically result from AH or various stimuli that would be either spontaneously reversible or after receiving a bronchodilator. The diagnosis could further be supported by presence of atopy, early sensitization, and family history of atopy. Whenever possible, spirometry should be performed to show reversibility of airway obstruction after bronchodilator therapy. Box 15 presents further clinical diagnostic symptoms and signs of asthma in children. For early identification of the risk of persistent asthma among children 5 years and younger, the Asthma Predictive Index (API) is one of tools used in the clinical setting. The modified Asthma Predictive Index (modified-API) is a clinical scoring tool that can be used to predict whether a child with intermittent wheezing before the age of 3 years will develop persistent asthma pattern during school-age years [Box 16]. , Children with history of four or more wheezing attacks (at least one physician diagnosed) and either one major or two minor criteria at 3 years of age will have fourfold to sevenfold increase in the risk of having asthma during later childhood. The modified-API can also identify children with a low likelihood of developing later asthma when they have negative index with a negative predictive value of 57%-82%. Assessment of asthma control combined with proper pharmacotherapy: This implies a continuous process with periodical assessment of asthma control combined with adjustments (if needed) to pharmacotherapy based on the level of control. It is strongly recommended to use asthma pharmacotherapy in a stepwise approach with the ultimate goal of achieving "optimal" control with "minimal" amount of medications and dosage. Compliance to and proper use of the prescribed medications and their devices is recommended to be addressed before any modification of treatment plans. In children, it is extremely important to select the best device for optimal treatment delivery [Box 17]. Action plan: It is recommended to be provided to patients and their caregivers, and includes medications, their doses, and technique. Action plan would normally include information for patient and caregiver on how to recognize worsening of asthma symptoms and advices of treatment modification in these situations. Finally, action plan will contain contact information of healthcare resources if help is needed. The goal of asthma treatment is to achieve and maintain control. Treatment is recommended to be adjusted continuously based on asthma control. If current treatment failed to achieve control, then treatment is recommended to be stepped up until control is achieved. Whenever control is maintained for at least 3 months, then treatment can be stepped down. This stepwise approach is essential to maintain optimum control with lowest step to minimize cost and maximize safety. For mild intermittent symptoms, SABA is considered as the first line of treatment. The need for SABA more than 3 times a week suggests suboptimal asthma control and indicates the need for controller therapy [Boxes 10 and 21]. As ICS represent the best and first option for controller treatment, treating physicians should be familiar with dosage amount (low, medium, and high) for different ICS formulations [Box 6]. The clinical benefits of intermittent systemic or ICS for children with intermittent and viral-induced wheezing remain controversial. While few studies in older children found small benefits, a study in young children found no effect. This practice should be discouraged until clear evidence-based guidelines are available on this aspect of asthma management (Evidence D). Children with frequent, severe asthma exacerbation or both are recommended to receive regular treatment with ICS (Evidence D). Asthmatic children when treated with ICS attain normal adult height, but at a later age. Growth retardation may be seen with all ICS when a high dose is chronically used. Asthmatic children receiving combination treatment (ICS and LABA) may require step down of therapy by stopping LABA whenever optimum control is achieved for good time. The available evidence indicates that the effect of theophylline is less than that of low-dose ICS, and side effects are more common. Oral β2-agonist should be avoided due to its slower onset of action and its tendency to produce more systemic side effects. Assessment of compliance, control of environment, and diagnosis are recommended to be revisited each time before treatment adjustments. Cromones (sodium cromoglycate and nedocromil sodium) are not recommended for preschool children. They have limited role in the long-term treatment of older children. Evidence showed that low-dose ICS is superior to cromones in the management of asthma. Severity assessment of the acute asthma exacerbation has an important role to support the acute management decisions that includes: pharmacological interventions, need for hospitalization, and need for intensive care unit admission. The assessment of acute asthma severity in young children is important both for clinical decision-making and evaluation of treatment effectiveness. ,,,,,,,, This is supported by the fact that pulmonary function measurement is not feasible as more than half of pediatric asthma exacerbation presented to emergency departments are of preschool-aged children. On the other hand, The Pediatric Respiratory Assessment Measure (PRAM) has been recently found to be feasible, valid, responsive, and reliable pediatric tool to determine asthma severity in children aged 2-17 years. The PRAM simply represents a useful means to record clinical signs in a standardized fashion with some degree of subjectivity in the ascertainment and coding of these signs [Box 22]. The PRAM score is a 12-point score consisting of oxygen saturation, suprasternal retractions, scalene muscle contraction, air entry, and wheezing. Measuring PRAM total score for asthmatic patients in emergency room can identify patients at risk of hospitalization [Box 23]. 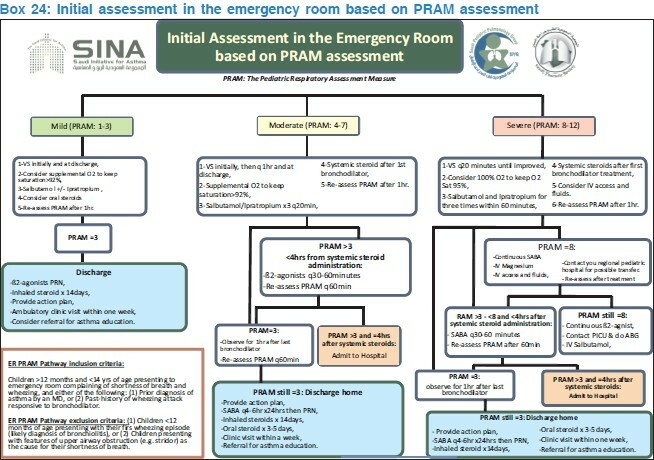 The initial assessment of patients is recommended to record the PRAM score at triage. The score is recommended to be checked after the initial treatment as well. Implementation of clinical pathway that utilizes PRAM score for the acute management of children with moderate to severe exacerbations will markedly decrease the rate of hospitalization without increasing the rate of return to emergency care. ,, Clinical pathways based on PRAM for inpatient asthma management that has been implemented in some North American hospital has been shown to decrease the length of stay and bronchodilator use with no adverse outcomes or increased acute care encounters. , We would recommend two pathways for acute asthma management based on the utilization of PRAM score. The emergency room management [Box 24] was classified to mild (PRAM score 1-3), moderate (PRAM score 4-7), and severe. ,,,, The inpatient management was split into three phases: phase I that covers initial management [Box 25] and phases II and III that cover continuation of management till discharge [Box 26]. Continuous fetal monitoring is recommended in severe asthma exacerbation. The use of prostaglandin F2α may be associated with severe bronchospasm and should be used with extreme caution (Evidence D). If asthma is well controlled during pregnancy, acute asthma is rare in labor. All asthma treatments are safe in pregnancy, and asthmatics should continue their usual asthma medications during pregnancy and in labor. In the absence of acute severe asthma, reserve Cesarean section for the usual obstetric indications. Pregnant asthmatics should be encouraged to breastfeed after delivery and to use asthma medications as normal during lactation. To ensure that patient is adherent to medications with a good technique. After dealing with the causes that are making asthma difficult to treat, the remaining asthma patients have a real problem of not responding to steroid therapy. Patients may differ in the degree of this phenomenon of "steroid unresponsiveness." Some of these patients may have the "pseudo-steroid" resistance status which is due to other coexisting conditions. , However, a significant percentage of patients do not respond adequately to high doses of inhaled steroids but will need continuous oral therapy to show a reasonable response, and are better defined as refractory cases, that is, asthmatic patients in whom it is not possible to take off oral steroids. These patients have persistent symptoms despite high doses of inhaled steroids and other "non-steroidal" asthma therapy. The SINA panel would like to thank the following consultant reviewers for their valuable comments on the 2012 update: Prof. Mark FitzGerald from the University of British Columbia, Vancouver, BC, Canada; Prof. Qutayba Hamid from the Meakins-Christie Laboratories, and the Montreal Chest Research Institute, Royal Victoria Hospital, McGill University, Montreal, Quebec, Canada; and Prof. Sheldon Spier, the University of British Columbia and Medical Director of the Children's Hospital Asthma program, Vancouver, British Columbia, Canada. The panel would like also to thank the following consultant reviewers for their valuable comments for the initial guidelines developed in 2009: Prof. Eric Bateman from the University of Cape Town Lung Institute, Cape Town, South Africa; Prof. Mark FitzGerald from the University of British Columbia, Vancouver, BC, Canada; and Prof. Ronald Olivenstein from the Meakins-Christie Laboratories, and the Montreal Chest Research Institute, Royal Victoria Hospital, McGill University, Montreal, Quebec, Canada. 1. Al Frayh AR, Shakoor Z, Gad El Rab MO, Hasnain SM. Increased prevalence of asthma in Saudi Arabia. Ann Allergy Asthma Immunol 2001;86:292-6. 2. Stewart WF, Ricci JA, Chee E, Morganstein D. Lost productive work time costs from health conditions in the United States: Results from the American Productivity Audit. J Occup Environ Med 2003;45:1234-46. 3. Al-Mobeireek A. Prescribing for asthmatic children in primary care. Are we following the guidelines? Saudi Med J 2003;24:1274. 4. Dashash NA, Mukhtar SH. Prescribing for asthmatic children in primary care. Are we following guidelines? Saudi Med J 2003;24:507-11. 5. Al-Moamary MS, Al-Hajjaj MS, Idrees MM, Zeitouni MO, Alanezi MO, Al-Jahdal HH, et al. 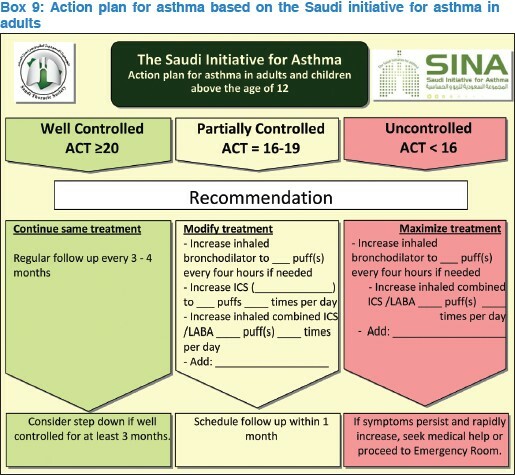 The Saudi Initiative for asthma. Ann Thorac Med 2009;4:216-33. 6. Wechsler ME. Managing asthma in primary care: Putting new guideline recommendations into context. Mayo Clinic Proc 2009;84:707-17. 7. Al-Ghamdi BR, Mahfouz AA, Abdelmoneim I, Khan MY, Daffallah AA. Altitude and bronchial asthma in south-western Saudi Arabia. East Mediterr Health J 2008;14:17-23. 8. Rabe KF, Adachi M, Lai CK, Soriano JB, Vermeire PA, Weiss KB, et al. Worldwide severity and control of asthma in children and adults: The global asthma insights and reality surveys. J Allergy Clin Immunol 2004;114:40-7. 9. Abudahish A, Bella H. Primary care physicians perceptions and practices on asthma care in Aseer region, Saudi Arabia. Saudi Med J 2006;27:333-7. 10. Alamoudi O. Prevalence of respiratory diseases in hospitalized patients in Saudi Arabia: A 5 years study 1996-2000. Ann Thorac Med 2006;1:76-80. 11. Colver AF. Underdiagnosis and undertreatment of asthma in childhood. Br Med J (Clin Res Ed) 1983;286:1511-2. 12. Speight AN, Lee DA, Hey EN. Undrediagnosis and undertreatment of asthma in childhood. Br Med J (Clin Res Ed) 1983;286:1253-6. 13. Al-Jahdali HH, Al-Hajjaj MS, Alanezi MO, Zeitoni MO, Al- Tasan TH. Asthma control assessment using asthma control test among patients attending 5 tertiary care hospitals in Saudi Arabia. Saudi Med J 2008;29:714-7. 14. Al Frayh AR. Asthma patterns in Saudi Arabian children. J R Soc Health 1990;110:98-100. 15. Al Frayh AR, Al Nahdi M, Bener AR, Jawadi TQ. Epidemiology of asthma and allergic rhinitis in two coastal regions of Saudi Arabia. Allergie Immunol (Paris) 1989;21:389-93. 16. Bener A, Al-Jawadi TQ, Ozkaragoz F, Anderson JA. Prevalence of asthma and wheeze in two different climatic areas of Saudi Arabia. Indian J Chest Dis Allied Sci 1993;35:9-15. 17. Hijazi N, Abalkhail B, Seaton A. Asthma and respiratory symptoms in urban and rural Saudi Arabia. Eur Respir J1998;12:41-4. 18. Alshehri MA, Abolfotouh MA, Sadeg A, Al Najjar YM, Asindi AA, Al Harthi AM, et al. Screening for asthma and associated risk factors among urban school boys in Abha city. Saudi Med J 2000;21:1048-53. 19. Al-Kabbaa AF, Al-Shamrani KM, Salih MA. Does the management of bronchial asthma by family physicians meet standards of the national protocol? J Family Community Med 2002;9:21-5. 20. Al Ghobain MO, Al-Hajjaj MS, Al Moamary MS. Asthma prevalence among 16- to 18-year-old adolescents in Saudi Arabia using the ISAAC questionnaire. BMC Public Health 2012;12:239. 21. Sobki SH, Zakzouk SM. Point prevalence of allergic rhinitis among Saudi children. Rhinology 2004;42:137-40. 22. Duran-Tauleria E, Rona RJ. Geographical and socioeconomic variation in the prevalence of asthma symptoms in English and Scottish children. Thorax 1999;54:476-81. 23. Hamid Q, Tulic MK. New insights into the pathophysiology of the small airways in asthma. Ann Thorac Med 2007;28:33-2. 24. Cohn L, Homer RJ, Marinov A, Rankin J, Bottomly K. Induction of airway mucus production By T helper 2 (Th2) cells: A critical role for interleukin 4 in cell recruitment but not mucus production. J Exp Med 1997;186:1737-47. 25. Akbari O, Stock P, Meyer E, Kronenberg M, Sidobre S, Nakayama T, et al. Essential role of NKT cells producing IL-4 and IL-13 in the development of allergen-induced airway hyperreactivity. Nat Med 2003;9:582-8. 26. Alzoghaibi MA, Bahammam AS. Circulating LTB4 and Eotaxin-1 in stable asthmatics on inhaled corticosteroids and long-acting β 2-agonists. Ann Thorac Med 2006;1:67-70. 27. Humbert M, Corrigan CJ, Kimmitt P, Till SJ, Kay AB, Durham SR. Relationship between IL-4 and IL-5 mRNA expression and disease severity in atopic asthma. Am J Respir Crit Care Med 1997;156(3 Pt 1):704-8. 28. Holgate ST, Peters-Golden M, Panettieri RA, Henderson WR Jr. Roles of cysteinyl leukotrienes in airway inflammation, smooth muscle function, and remodeling. J Allergy Clin Immunol 2003;111(1 Suppl):S18-34. 29. Tobin MJ. Asthma, airway biology, and nasal disorders in AJRCCM 2003. Am J Respir Crit Care Med 2004;169:265-76. 30. Linzer J. Review of Asthma: Pathophysiology and Current Treatment Options. Clin Pediatr Emerg Med 2007;8:87-95. 31. Kendrick AH, Higgs CM, Whitfield MJ, Laszlo G. Accuracy of perception of severity of asthma: Patients treated in general practice. BMJ 1993;307:422-4. 32. An SS, Bai TR, Bates JH, Black JL, Brown RH, Brusasco V, et al. Airway smooth muscle dynamics: A common pathway of airway obstruction in asthma. Eur Respir J 2007;29:834-60. 33. Kinet JP. The high-affinity IgE receptor (Fc epsilon RI): From physiology to pathology. Annu Rev Immunol 1999;17:931-72. 34. King GG, Pare PD, Seow CY. The mechanics of exaggerated airway narrowing in asthma: The role of smooth muscle. Respir Physiol 1999;118:1-13. 35. James AL, Pare PD, Hogg JC. The mechanics of airway narrowing in asthma. Am Rev Respir Dis 1989;139:242-6. 36. Niimi A, Matsumoto H, Takemura M, Ueda T, Chin K, Mishima M. Relationship of airway wall thickness to airway sensitivity and airway reactivity in asthma. Am J Respir Crit Care Med 2003;168:983-8. 37. Prevention GsfAma. Global Initiative for Asthma (GINA). Available from: http://www.ginAsthma.org. [Last accessed on 2012 Jun 02]. 38. prevention GsfAma. Global Initiative for Asthma in children 5 years and younger. 2009 Available from: http://www.ginAsthma.org. [Last accessed on 2012 Jun 02]. 39. Bousquet J, Clark TJ, Hurd S, Khaltaev N, Lenfant C, O'Byrne P, et al. GINA guidelines on asthma and beyond. Allergy 2007;62:102-12. 40. Busse WW. National Asthma Education and Prevention Program. Expert Panel Report: Guidelines for the Diagnosis and Management of Asthma Update on Selected Topics--2002. J Allergy Clin Immunol 2002;110 (5 Suppl):S141-219. 41. Jadad AR, Moher M, Browman GP, Booker L, Sigouin C, Fuentes M, et al. Systematic reviews and meta-analyses on treatment of asthma: Critical evaluation. BMJ 2000;320:537-40. 42. Stempel DA, McLaughin TP, Stanford RH, Fuhlbrigge AL. Patterns of asthma control: A 3-year analysis of patient claims. J Allergy Clin Immunol 2005;115:935-9. 43. Horne R, Price D, Cleland J, Costa R, Covey D, Gruffydd-Jones K, et al. Can asthma control be improved by understanding the patient's perspective? BMC Pulm Med 2007;7:8. 44. Gibson PG, Fujimura M, Niimi A. Eosinophilic bronchitis: Clinical manifestations and implications for treatment. Thorax 2002;57:178-82. 45. Al-Kassimi FA, Abba AA, Al-Hajjaj MS, Alhamad EH, Raddaoui E, Shaikh SA. Asthma masquerading as chronic obstructive pulmonary disease: A study of smokers fulfilling the GOLD definition of chronic obstructive pulmonary disease. Respiration 2011;82:19-27. 46. Alharbi M, Almutairi A, Alotaibi D, Alotaibi A, Shaikh S, Bahammam AS. The prevalence of asthma in patients with obstructive sleep apnoea. Prim Care Respir J 2009;18:328-30. 47. Berlow BA. Eight key questions to ask when your patient with asthma doesn't get better. Am Fam Physician 1997;55:183-9. 48. Price D. Asthma and allergic rhinitis: Linked in treatment and outcomes. Ann Thorac Med 2010;5:63-4. 49. Fireman P. Rhinitis and asthma connection: Management of coexisting upper airway allergic diseases and asthma. Allergy Asthma Proc 2000;21:45-54. 50. Al-Mobeireek AF, Al-Sarhani A, Al-Amri S, Bamgboye E, Ahmed SS. Chronic cough at a non-teaching hospital: Are extrapulmonary causes overlooked? Respirology 2002;7:141-6. 52. Nathan RA, Sorkness CA, Kosinski M, Schatz M, Li JT, Marcus P, et al. Development of the asthma control test: A survey for assessing asthma control. J Allergy Clin Immunol 2004;113:59-65. 53. Schatz M, Sorkness CA, Li JT, Marcus P, Murray JJ, Nathan RA, et al. Asthma Control Test: Reliability, validity, and responsiveness in patients not previously followed by asthma specialists. J Allergy Clin Immunol 2006;117:549-56. 54. Cowie RL, Underwood MF, Field SK. Asthma symptoms do not predict spirometry. Can Respir J 2007;14:339-42. 55. Tashkin DP, Altose MD, Connett JE, Kanner RE, Lee WW, Wise RA. Methacholine reactivity predicts changes in lung function over time in smokers with early chronic obstructive pulmonary disease. The Lung Health Study Research Group. Am J Respir Crit Care Med 1996;153 (6 Pt 1):1802-11. 56. Witteman AM, Stapel SO, Perdok GJ, Sjamsoedin DH, Jansen HM, Aalberse RC, et al. The relationship between RAST and skin test results in patients with asthma or rhinitis: A quantitative study with purified major allergens. J Allergy Clin Immunol 1996;97(1 Pt 1):16-25. 57. Creticos PS. Treatment options for initial maintenance therapy of persistent asthma: A review of inhaled corticosteroids and leukotriene receptor antagonists. Drugs 2003;63 (Suppl 2):1-20. 58. Lemanske RF, Jr., Sorkness CA, Mauger EA, Lazarus SC, Boushey HA, Fahy JV, et al. Inhaled corticosteroid reduction and elimination in patients with persistent asthma receiving salmeterol: A randomized controlled trial. JAMA 2001;285:2594-603. 59. Pauwels RA, Pedersen S, Busse WW, Tan WC, Chen YZ, Ohlsson SV, et al. Early intervention with budesonide in mild persistent asthma: A randomised, double-blind trial. Lancet 2003;361:1071-6. 60. Szefler SJ, Martin RJ, King TS, Boushey HA, Cherniack RM, Chinchilli VM, et al. Significant variability in response to inhaled corticosteroids for persistent asthma. J Allergy Clin Immunol 2002;109:410-8. 61. Masoli M, Weatherall M, Holt S, Beasley R. Moderate dose inhaled corticosteroids plus salmeterol versus higher doses of inhaled corticosteroids in symptomatic asthma. Thorax. 2005;60:730-4. Epub 2005/09/02. 62. O'Byrne PM, Bisgaard H, Godard PP, Pistolesi M, Palmqvist M, Zhu Y, et al. Budesonide/formoterol combination therapy as both maintenance and reliever medication in asthma. Am J Respir Crit Care Med 2005;171:129-36. 63. Cates CJ, Cates MJ. Regular treatment with formoterol for chronic asthma: Serious adverse events. Cochrane Database Syst Rev 2012;4:CD006923. 64. Pearlman DS, Greos L, LaForce C, Orevillo CJ, Owen R, Higgins M. Bronchodilator efficacy of indacaterol, a novel once-daily beta2-agonist, in patients with persistent asthma. Ann Allergy Asthma Immunol 2008;101:90-5. 65. Sugihara N, Kanada S, Haida M, Ichinose M, Adachi M, Hosoe M, et al. 24-h bronchodilator efficacy of single doses of indacaterol in Japanese patients with asthma: A comparison with placebo and salmeterol. Respir Med 2010;104:1629-37. 66. Cazzola M, Segreti A, Matera MG. Novel bronchodilators in asthma. Curr Opin Pulm Med 2010;16:6-12. 67. Cazzola M, Matera MG. Novel long-acting bronchodilators for COPD and asthma. Br J Pharmacol 2008;155:291-9. 68. LaForce C, Korenblat P, Osborne P, Dong F, Higgins M. 24-hour bronchodilator efficacy of single doses of indacaterol in patients with persistent asthma: Comparison with placebo and formoterol. Curr Med Res Opin 2009;25:2353-9. 69. Bjermer L, Diamant Z. The use of leukotriene receptor antagonists (LTRAs) as complementary therapy in asthma. Monaldi archives for chest disease = Archivio Monaldi per le malattie del torace/Fondazione clinica del lavoro, IRCCS [and] Istituto di clinica tisiologica e malattie apparato respiratorio. Universita di Napoli: Secondo ateneo; 2002. p. 76-83. 70. Idrees MM, Al Moamary MS. Blocking leukotrienes optimize asthma control: The BLOC survey. Ann Thorac Med 2007;2:99-102. 71. Bisgaard H; Study Group on M, Respiratory Syncytial V. A randomized trial of montelukast in respiratory syncytial virus postbronchiolitis. Am J Respir Crit Care Med 2003;167:379-83. 72. Straub DA, Minocchieri S, Moeller A, Hamacher J, Wildhaber JH. The effect of montelukast on exhaled nitric oxide and lung function in asthmatic children 2 to 5 years old. Chest 2005;127:509-14. 73. Straub DA, Moeller A, Minocchieri S, Hamacher J, Sennhauser FH, Hall GL, et al. The effect of montelukast on lung function and exhaled nitric oxide in infants with early childhood asthma. Eur Respir J 2005;25:289-94. 74. Bisgaard H, Zielen S, Garcia-Garcia ML, Johnston SL, Gilles L, Menten J, et al. Montelukast reduces asthma exacerbations in 2- to 5-year-old children with intermittent asthma. Am J Respir Crit Care Med 2005;171:315-22. 75. Elias JA, Lee CG, Zheng T, Ma B, Homer RJ, Zhu Z. New insights into the pathogenesis of asthma. J Clin Invest 2003;111:291-7. 76. D'Amato G, Bucchioni E, Oldani V, Canonica W. Treating Moderate-to-Severe Allergic Asthma with a Recombinant Humanized Anti-IgE Monoclonal Antibody (Omalizumab). Treat Respir Med 2006;5:393-8. 77. Busse W, Corren J, Lanier BQ, McAlary M, Fowler-Taylor A, Cioppa GD, et al. Omalizumab, anti-IgE recombinant humanized monoclonal antibody, for the treatment of severe allergic asthma. J Allergy Clin Immunol 2001;108:184-90. 78. Busse WW, Morgan WJ, Gergen PJ, Mitchell HE, Gern JE, Liu AH, et al. Randomized trial of omalizumab (anti-IgE) for asthma in inner-city children. N Engl J Med 2011;364:1005-15. 79. Cates CJ, Crilly JA, Rowe BH. Holding chambers (spacers) versus nebulisers for beta-agonist treatment of acute asthma. Cochrane Database Syst Rev 2006;2:CD000052. 80. Peters SP, Kunselman SJ, Icitovic N, Moore WC, Pascual R, Ameredes BT, et al. Tiotropium bromide step-up therapy for adults with uncontrolled asthma. N Engl J Med 2010;363:1715-26. 81. Nair A, Menzies D, Barnes M, Burns P, McFarlane L, Lipworth BJ. Respirable dose delivery of fluticasone propionate from a small valved holding chamber, a compact breath actuated integrated vortex device and a metered dose inhaler. Br J Clin Pharmacol 2008;66:20-6. 82. Giraud V, Allaert FA, Roche N. Inhaler technique and asthma: Feasability and acceptability of training by pharmacists. Respir Med 2011;105:1815-22. 83. Giraud V, Allaert FA. Improved asthma control with breath-actuated pressurized metered dose inhaler (pMDI): The SYSTER survey. Eur Rev Med Pharmacol Sci 2009;13:323-30. 84. Donnell D. Inhaled corticosteroid delivery systems: Clinical role of a breath-actuated device. Eur Rev Med Pharmacol Sci 2001;5:7-16. 85. Al-Jahdali HH, Al-Zahrani AI, Al-Otaibi ST, Hassan IS, Al- Moamary MS, Al-Duhaim AS, et al. Perception of the role of inhaled corticosteroids and factors affecting compliance among asthmatic adult patients. Saudi Med J 2007;28:569-73. 86. Alsheri MA. Comparative study of different inhaler devices in asthmatic children. Ann Saudi Med 2003;23:349-53. 87. Al-Wasil MA, Al-Mohaimeed A. Assessment of inhalation technique in primary care asthmatic patients using metered-dose inhalers with or without a spacer. Ann Saudi Med 2003;23:264-9. 88. Al-Haddad N, Nour A, Koshak E. Asthma care: Structural foundations at primary health care at Al-Qassim region, Saudi Arabia. Ann Thorac Med 2006;1:8-11. 89. Al Moamary MS. Unconventional therapy use among asthma patients in a tertiary care center in Riyadh, Saudi Arabia. Ann Thorac Med 2008;3:48-51. 90. Al-Haddad N, Al-Ansari SS, Al-Shari AT. Impact of asthma education program on asthma knowledge of general practitioners. Ann Saudi Med 1997;17:550-2. 91. Barnes NC. Can guideline-defined asthma control be achieved? The Gaining Optimal Asthma Control study. American journal of respiratory and critical care medicine 2004;170:830-1. 92. Bateman ED, Boushey HA, Bousquet J, Busse WW, Clark TJ, Pauwels RA, et al. Can guideline-defined asthma control be achieved? The Gaining Optimal Asthma ControL study. Am J Respir Crit Care Med 2004;170:836-44. 93. Gibson PG, Powell H. Written action plans for asthma: An evidence-based review of the key components. Thorax 2004;59:94-9. 94. Gibson PG, Powell H, Coughlan J, Wilson AJ, Hensley MJ, Abramson M, et al. Limited (information only) patient education programs for adults with asthma. Cochrane Database Syst Rev 2002:CD001005. 95. Zaraket R, Al-Tannir MA, Bin Abdulhak AA, Shatila A, Lababidi H. Parental perceptions and beliefs about childhood asthma: A cross-sectional study. Croat Med J 2011;52:637-43. 96. Al-Binali AM, Mahfouz AA, Al-Fifi S, Naser SM, Al-Gelban KS. Asthma knowledge and behaviours among mothers of asthmatic children in Aseer, south-west Saudi Arabia. East Mediterr Health J 2010;16:1153-8. 97. Al-Yami SM, Mohajer KA, Al-Jeraisy MI, Batarfi AM, Abolfotouh MA. Recurrent visits and admissions of children with asthma in central Saudi Arabia. Saudi Med J 2010;30:921-4. 98. Al-Shimemeri A, Al-Ghadeer H, Giridhar H, Al-Jahdali M, Al-Moamary M, Khan J. Impact of an extensive Asthma education campaign for physicians on their drug prescription practices. Ann Thorac Med 2006;1:20-5. 99. Al-Mobeireek A. The efficacy of a management protocol in reducing emergency visits and hospitalizations in chronic asthmatics. Saudi Med J 2003;24:694-5. 100. Alamoudi OS. The efficacy of a management protocol in reducing emergency visits and hospitalizations in chronic asthmatics. Saudi Med J 2002;23:1373-9. 101. Al-Jahdali HH, Al-Omar AM, Al-Moamary MS, Al-Duhaim AS, Al-Hodeib AS, Hassan IS, et al. Implementation of the national asthma management guidelines in the emergency department. Saudi Med J 2004;25:1208-11. 102. Buist AS, Vollmer WM, Wilson SR, Frazier EA, Hayward AD. A randomized clinical trial of peak flow versus symptom monitoring in older adults with asthma. Am J Respir Crit Care Med 2006;174:1077-87. 103. Al-Frayh AS, Hasnain SM, Gad-El-Rab MO, Schwartz B, Al-Mobairek K, Al-Sedairy ST. House dust mite allergens in Saudi Arabia: Regional variations and immune response. Ann Saudi Med 1997;17:156-60. 104. Hasnain SM, Fatima K, Al-Frayh A. Prevalence of airborne allergenic Amaranthus viridis pollen in seven different regions of Saudi Arabia. Ann Saudi Med 2007;27:259-63. 105. Troisi RJ, Speizer FE, Rosner B, Trichopoulos D, Willett WC. Cigarette smoking and incidence of chronic bronchitis and asthma in women. Chest 1995;108:1557-61. 106. Tunnicliffe WS, Fletcher TJ, Hammond K, Roberts K, Custovic A, Simpson A, et al. Sensitivity and exposure to indoor allergens in adults with differing asthma severity. Eur Respir J 1999;13:654-9. 107. Nicholson KG, Nguyen-Van-Tam JS, Ahmed AH, Wiselka MJ, Leese J, Ayres J, et al. Randomised placebo-controlled crossover trial on effect of inactivated influenza vaccine on pulmonary function in asthma. Lancet 1998;351:326-31. 108. Bueving HJ, van der Wouden JC, Raat H, Bernsen RM, de Jongste JC, van Suijlekom-Smit LW, et al. Influenza vaccination in asthmatic children: Effects on quality of life and symptoms. Eur Respir J 2004;24:925-31. 109. Cates CJ, Cates MJ, Lasserson TJ. Regular treatment with formoterol for chronic asthma: Serious adverse events. Cochrane Database Syst Rev 2008;4:CD006923. 110. Humbert M, Holgate S, Boulet LP, Bousquet J. Asthma control or severity: That is the question. Allergy 2007;62:95-101. 111. Koshak EA. Classification of asthma according to revised 2006 GINA: Evolution from severity to control. Ann Thorac Med 2007;2:45-6. 112. Al-Moamary MS, Al-Kordi AG, Al Ghobain MO, Tamim HM. Utilization and responsiveness of the asthma control test (ACT) at the initiation of therapy for patients with asthma: A randomized controlled trial. BMC Pulm Med 2012;12:14. 113. Lababidi H, Hijaoui A, Zarzour M. Validation of the Arabic version of the asthma control test. Ann Thorac Med 2008;3:44-7. 114. Alanezi M, Al-Jahdali HH, Al-Hajjaj MS, Zeitoni MO, Al-Tasan TH. 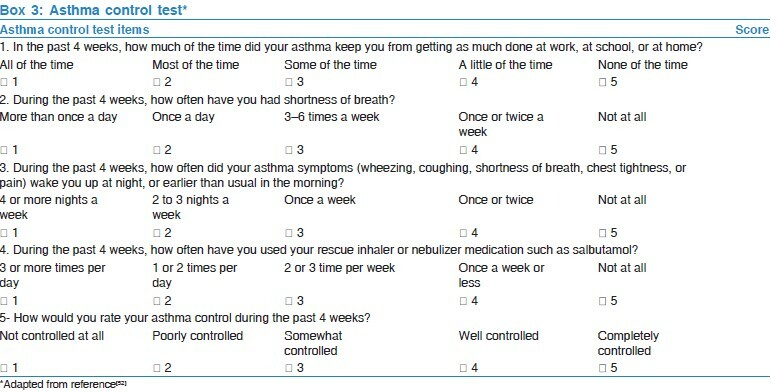 Levels of acceptance of Asthma Control Test questionnaire among Saudi patients attending 5 tertiary care hospitals in Saudi Arabia. Saudi Med J 2009;30:546-9. 115. Schatz M, Kosinski M, Yarlas AS, Hanlon J, Watson ME, Jhingran P. The minimally important difference of the Asthma Control Test. J Allergy Clin Immunol 2009;124:719-23 e1. 116. Leynaert B, Bousquet J, Neukirch C, Liard R, Neukirch F. Perennial rhinitis: An independent risk factor for asthma in nonatopic subjects: Results from the European Community Respiratory Health Survey. J Allergy Clin Immunol 1999;104 (2 Pt 1):301-4. 117. Taramarcaz P, Gibson PG. Intranasal corticosteroids for asthma control in people with coexisting asthma and rhinitis. Cochrane Database Syst Rev 2003:CD003570. 118. Dahl R, Nielsen LP, Kips J, Foresi A, Cauwenberge P, Tudoric N, et al. Intranasal and inhaled fluticasone propionate for pollen-induced rhinitis and asthma. Allergy 2005;60:875-81. 119. Philip G, Nayak AS, Berger WE, Leynadier F, Vrijens F, Dass SB, et al. The effect of montelukast on rhinitis symptoms in patients with asthma and seasonal allergic rhinitis. Curr Med Res Opin 2004;20:1549-58. 120. Vignola AM, Humbert M, Bousquet J, Boulet LP, Hedgecock S, Blogg M, et al. Efficacy and tolerability of anti-immunoglobulin E therapy with omalizumab in patients with concomitant allergic asthma and persistent allergic rhinitis: SOLAR. Allergy 2004;59:709-17. 121. Ignacio-Garcia JM, Gonzalez-Santos P. Asthma self-management education program by home monitoring of peak expiratory flow. Am J Respir Crit Care Med 1995;151(2 Pt 1):353-9. 122. Hawkins G, McMahon AD, Twaddle S, Wood SF, Ford I, Thomson NC. Stepping down inhaled corticosteroids in asthma: Randomised controlled trial. BMJ 2003;326:1115. 123. Powell H, Gibson PG. High dose versus low dose inhaled corticosteroid as initial starting dose for asthma in adults and children. Cochrane Database Syst Rev 2004:CD004109. 124. Boulet LP, Drollmann A, Magyar P, Timar M, Knight A, Engelstatter R, et al. Comparative efficacy of once-daily ciclesonide and budesonide in the treatment of persistent asthma. Respir Med 2006;785:94-100. 125. Masoli M, Weatherall M, Holt S, Beasley R. Budesonide once versus twice-daily administration: Meta-analysis. Respirology 2004;9:528-34. 126. Bateman ED, Fairall L, Lombardi DM, English R. Budesonide/formoterol and formoterol provide similar rapid relief in patients with acute asthma showing refractoriness to salbutamol. Respira Res 2006;7:13. 127. Randell TL, Donaghue KC, Ambler GR, Cowell CT, Fitzgerald DA, van Asperen PP. Safety of the newer inhaled corticosteroids in childhood asthma. Paediatr Drugs 2003;5:481-504. 128. Berger WE. Levalbuterol: Pharmacologic properties and use in the treatment of pediatric and adult asthma. Ann Allergy Asthma Immunol 2003;90:583-91. 129. Shah L, Wilson AJ, Gibson PG, Coughlan J. Long acting beta-agonists versus theophylline for maintenance treatment of asthma. Cochrane Database Syst Rev 2003:CD001281. 130. O'Byrne PM, Kerstjens HA. Inhaled beta 2-agonists in the treatment of asthma. N Engl J Med 1996;335:886-8. 131. Barnes PJ, Pedersen S. Efficacy and safety of inhaled corticosteroids in asthma. Report of a workshop held in Eze, France, October 1992. Am Rev Respir Dis 1993;148 (4 Pt 2):S1-26. 132. Gibson PG, Powell H, Coughlan J, Wilson AJ, Abramson M, Haywood P, et al. Self-management education and regular practitioner review for adults with asthma. Cochrane Database Syst Rev 2003:CD001117. 133. Powell H, Gibson PG. Initial starting dose of inhaled corticosteroids in adults with asthma: A systematic review. Thorax 2004;59:1041-5. 134. Drazen JM, Israel E, O'Byrne PM. Treatment of asthma with drugs modifying the leukotriene pathway. N Engl J Med 1999;340:197-206. 135. Wilson AM, Dempsey OJ, Sims EJ, Lipworth BJ. A comparison of topical budesonide and oral montelukast in seasonal allergic rhinitis and asthma. Clin Exp Allergy 2001;31:616-24. 136. O'Byrne PM, Barnes PJ, Rodriguez-Roisin R, Runnerstrom E, Sandstrom T, Svensson K, et al. Low dose inhaled budesonide and formoterol in mild persistent asthma: The OPTIMA randomized trial. Am J Respir Crit Care Med 2001;164(8 Pt 1):1392-7. 137. Godard P, Greillier P, Pigearias B, Nachbaur G, Desfougeres JL, Attali V. Maintaining asthma control in persistent asthma: Comparison of three strategies in a 6-month double-blind randomised study. Respir Med 2008;102:1124-31. 138. Kankaanranta H, Lahdensuo A, Moilanen E, Barnes PJ. Add-on therapy options in asthma not adequately controlled by inhaled corticosteroids: A comprehensive review. Respir Res 2004;5:17. 139. Lundborg M, Wille S, Bjermer L, Tilling B, Lundgren M, Telg G, et al. Maintenance plus reliever budesonide/formoterol compared with a higher maintenance dose of budesonide/formoterol plus formoterol as reliever in asthma: An efficacy and cost-effectiveness study. Curr Med Res Opin 2006;22:809-21. 140. Bateman ED, Bousquet J, Keech ML, Busse WW, Clark TJ, Pedersen SE. The correlation between asthma control and health status: The GOAL study. Eur Respir J 2007;29:56-62. 141. Chowdhury BA, Dal Pan G. The FDA and safe use of long-acting beta-agonists in the treatment of asthma. N Engl J Med 2010;362:1169-71. 142. Koshak EA. New FDA safety warnings for LABAs: A call for asthma guidelines revisit for solo beta agonist. Ann Thorac Med 2010;5:65-6. 143. Powell H, Gibson PG. Inhaled corticosteroid doses in asthma: An evidence-based approach. Med J Aust 2003;178:223-5. 144. Vaquerizo MJ, Casan P, Castillo J, Perpina M, Sanchis J, Sobradillo V, et al. Effect of montelukast added to inhaled budesonide on control of mild to moderate asthma. Thorax 2003;58:204-10. 145. Joos S, Miksch A, Szecsenyi J, Wieseler B, Grouven U, Kaiser T, et al. Montelukast as add-on therapy to inhaled corticosteroids in the treatment of mild to moderate asthma: A systematic review. Thorax 2008;63:453-62. 146. Zeiger RS, Szefler SJ, Phillips BR, Schatz M, Martinez FD, Chinchilli VM, et al. Response profiles to fluticasone and montelukast in mild-to-moderate persistent childhood asthma. J Allergy Clin Immunol 2006;117:45-52. 147. Evans DJ, Taylor DA, Zetterstrom O, Chung KF, O'Connor BJ, Barnes PJ. A comparison of low-dose inhaled budesonide plus theophylline and high-dose inhaled budesonide for moderate asthma. N Engl J Med 1997;337:1412-8. 148. Bateman ED, Kornmann O, Schmidt P, Pivovarova A, Engel M, Fabbri LM. Tiotropium is noninferior to salmeterol in maintaining improved lung function in B16-Arg/Arg patients with asthma. J Allergy Clin Immunol 2011;128:315-22. 149. Smith LJ. Anticholinergics for patients with asthma? N Engl J Med 2010;363:1764-5. 150. Al-Hajjaj MS. Difficult-to-treat asthma, is it really difficult? Ann Thorac Med 2011;6:1-2. 151. Pauwels RA, Lofdahl CG, Postma DS, Tattersfield AE, O'Byrne P, Barnes PJ, et al. Effect of inhaled formoterol and budesonide on exacerbations of asthma. Formoterol and Corticosteroids Establishing Therapy (FACET) International Study Group. N Engl J Med 1997;337:1405-11. 152. Virchow JC, Jr., Prasse A, Naya I, Summerton L, Harris A. Zafirlukast improves asthma control in patients receiving high-dose inhaled corticosteroids. Am J Respir Crit Care Med 2000;162(2 Pt 1):578-85. 153. American Lung Association Asthma Clinical Research C. Clinical trial of low-dose theophylline and montelukast in patients with poorly controlled asthma. Am J Respir Crit Care Med 2007;175:235-42. 154. Kerstjens HA, Disse B, Schroder-Babo W, Bantje TA, Gahlemann M, Sigmund R, et al. Tiotropium improves lung function in patients with severe uncontrolled asthma: A randomized controlled trial. J Allergy Clin Immunol 2011;128:308-14. 155. Rivington RN, Boulet LP, Cote J, Kreisman H, Small DI, Alexander M, et al. Efficacy of Uniphyl, salbutamol, and their combination in asthmatic patients on high-dose inhaled steroids. Am J Respir Crit Care Med 1995;151(2 Pt 1):325-32. 156. Waldeck B. Enantiomers of bronchodilating beta2-adrenoceptor agonists: Is there a cause for concern? J Allergy Clin Immunol 1999;103(5 Pt 1):742-8. 157. Cox L, Nelson H, Lockey R, Calabria C, Chacko T, Finegold I, et al. Allergen immunotherapy: A practice parameter third update. J Allergy Clin Immunol 2011;127(1 Suppl):S1-55. 158. Madsen F. EAACI 'Standards for practical allergen-specific immunotherapy'. Allergy 2007;62:332. 159. Alvarez-Cuesta E, Bousquet J, Canonica GW, Durham SR, Malling HJ, Valovirta E, et al. Standards for practical allergen-specific immunotherapy. 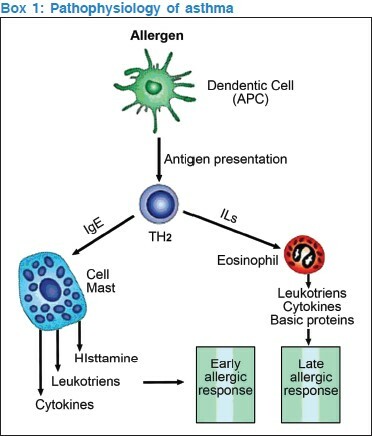 Allergy 2006;61 Suppl 82:1-20. 160. Jacobsen L, Niggemann B, Dreborg S, Ferdousi HA, Halken S, Host A, et al. Specific immunotherapy has long-term preventive effect of seasonal and perennial asthma: 10-year follow-up on the PAT study. Allergy 2007;62:943-8. 161. Moller C, Dreborg S, Ferdousi HA, Halken S, Host A, Jacobsen L, et al. Pollen immunotherapy reduces the development of asthma in children with seasonal rhinoconjunctivitis (the PAT-study). J Allergy Clin Immunol 2002;109:251-6. 162. Eng PA, Reinhold M, Gnehm HP. Long-term efficacy of preseasonal grass pollen immunotherapy in children. Allergy 2002;57:306-12. 163. Eng PA, Borer-Reinhold M, Heijnen IA, Gnehm HP. Twelve-year follow-up after discontinuation of preseasonal grass pollen immunotherapy in childhood. Allergy 2006;61:198-201. 164. Joint Task Force on Practice Parameters; American Academy of Allergy, Asthma and Immunology; American College of Allergy, Asthma and Immunology; Joint Council of Allergy, Asthma and Immunology. Allergen immunotherapy: A practice parameter second update. J Allergy Clin Immunol 2007;120(3 Suppl):S25-85. 165. Jacobsen L. Preventive aspects of immunotherapy: Prevention for children at risk of developing asthma. Ann Allergy Asthma Immunol 2001;87(1 Suppl 1):43-6. 166. Abramson MJ, Puy RM, Weiner JM. Injection allergen immunotherapy for asthma. Cochrane Database Syst Rev 2010:CD001186. 167. Kopp MV. Role of immunmodulators in allergen-specific immunotherapy. Allergy 2011;66:792-7. 168. Sandstrom T. Omalizumab in the management of patients with allergic (IgE-mediated) asthma. J Asthma Allergy 2009;2:49-62. 169. Stock P, Rolinck-Werninghaus C, Wahn U, Hamelmann E. The role of anti-IgE therapy in combination with allergen specific immunotherapy for seasonal allergic rhinitis: Clinical immunotherapeutics, biopharmaceuticals and gene therapy. BioDrugs 2007;21:403-10. 170. Reddel H, Ware S, Marks G, Salome C, Jenkins C, Woolcock A. Differences between asthma exacerbations and poor asthma control. Lancet 1999;353:364-9. 171. Al-Dawood KM. Pattern and risk factors associated with hospital emergency visits among schoolboys with bronchial Asthma in Al-Khobar. Ann Saudi Med 2002;22:29-33. 172. Courtney AU, McCarter DF, Pollart SM. Childhood asthma: Treatment update. Am Fam Physician 2005;71:1959-68. 173. O'Driscoll BR, Howard LS, Davison AG;British Thoracic S. BTS guideline for emergency oxygen use in adult patients. Thorax 2008;63 Suppl 6:vi1-68. 174. McFadden ER Jr. Critical appraisal of the therapy of asthma--an idea whose time has come. Am Rev Respir Dis 1986;133:723-4. 175. Rossing TH, Fanta CH, Goldstein DH, Snapper JR, McFadden ER, Jr. Emergency therapy of asthma: Comparison of the acute effects of parenteral and inhaled sympathomimetics and infused aminophylline. Am Rev Respir Dis 1980;122:365-71. 176. Lanes SF, Garrett JE, Wentworth CE, 3rd, Fitzgerald JM, Karpel JP. The effect of adding ipratropium bromide to salbutamol in the treatment of acute asthma: A pooled analysis of three trials. Chest 1998;114:365-72. 177. Stoodley RG, Aaron SD, Dales RE. The role of ipratropium bromide in the emergency management of acute asthma exacerbation: A metaanalysis of randomized clinical trials. Ann Emerg Med 1999;34:8-18. 178. Rodrigo G, Rodrigo C, Burschtin O. A meta-analysis of the effects of ipratropium bromide in adults with acute asthma. Am J Med. 1999;107:363-70. 179. Rowe BH, Spooner C, Ducharme FM, Bretzlaff JA, Bota GW. Early emergency department treatment of acute asthma with systemic corticosteroids. Cochrane Database Syst Rev 2001;CD002178. 180. Rowe BH, Bota GW, Fabris L, Therrien SA, Milner RA, Jacono J. Inhaled budesonide in addition to oral corticosteroids to prevent asthma relapse following discharge from the emergency department: A randomized controlled trial. JAMA 1999;281:2119-26. 181. Rowe BH, Bretzlaff JA, Bourdon C, Bota GW, Camargo CA, Jr. Magnesium sulfate for treating exacerbations of acute asthma in the emergency department. Cochrane Database Syst Rev 2000:CD001490. 182. Parameswaran K, Belda J, Rowe BH. Addition of intravenous aminophylline to beta2-agonists in adults with acute asthma. Cochrane Database Syst Rev 2000;CD002742. 183. Graham VA, Milton AF, Knowles GK, Davies RJ. Routine antibiotics in hospital management of acute asthma. Lancet 1982;1:418-20. 184. Badminton MN, Campbell AK, Rembold CM. Differential regulation of nuclear and cytosolic Ca2+ in HeLa cells. J Biol Chem 1996;271:31210-4. 185. Anagnostou K, Harrison B, Iles R, Nasser S. Risk factors for childhood asthma deaths from the UK Eastern Region Confidential Enquiry 2001-2006. Primary care respiratory journal: Journal of the General Practice Airways Group. 2012;21(1):71-7. Epub 2012/01/06. 186. Spitzer WO, Suissa S, Ernst P, Horwitz RI, Habbick B, Cockcroft D, et al. The use of beta-agonists and the risk of death and near death from asthma. N Engl J Med 1992;326:501-6. 187. Suissa S, Blais L, Ernst P. Patterns of increasing beta-agonist use and the risk of fatal or near-fatal asthma. Eur Respir J 1994;7:1602-9. 188. Rowe BH, Keller JL, Oxman AD. Effectiveness of steroid therapy in acute exacerbations of asthma: A meta-analysis. Am J Emerg Med 1992;10:301-10. 189. Chien JW, Ciufo R, Novak R, Skowronski M, Nelson J, Coreno A, et al. Uncontrolled oxygen administration and respiratory failure in acute asthma. Chest 2000;117:728-33. 190. Kerem E, Levison H, Schuh S, O'Brodovich H, Reisman J, Bentur L, et al. Efficacy of albuterol administered by nebulizer versus spacer device in children with acute asthma. J Pediatr 1993;123:313-7. 191. Rodrigo C, Rodrigo G. Salbutamol treatment of acute severe asthma in the ED: MDI versus hand-held nebulizer. Am J Emerg Med 1998;16:637-42. 192. Cates CC, Bara A, Crilly JA, Rowe BH. Holding chambers versus nebulisers for beta-agonist treatment of acute asthma. Cochrane Database Syst Rev 2003:CD000052. 193. Rowe BH, Spooner C, Ducharme FM, Bretzlaff JA, Bota GW. Early emergency department treatment of acute asthma with systemic corticosteroids. Cochrane Database Syst Rev 2001:CD002178. 194. Tokuda Y, Miyagi S. Oxygen treatment for acute severe asthma. Home oxygenation would be more effective. BMJ 2001;323:1069. 195. Inwald D, Roland M, Kuitert L, McKenzie SA, Petros A. Oxygen treatment for acute severe asthma. BMJ 2001;323:98-100. 196. Gleeson JG, Green S, Price JF. Air or oxygen as driving gas for nebulised salbutamol. Arch Dis Child 1988;63:900-4. 197. Douglas JG, Rafferty P, Fergusson RJ, Prescott RJ, Crompton GK, Grant IW. Nebulised salbutamol without oxygen in severe acute asthma: How effective and how safe? Thorax 1985;40:180-3. 198. Chassany O, Fullerton S. Meta-analysis of the effects of ipratropium bromide in adults with acute asthma. Am J Med 2000;108:596-7. 199. Rowe BH, Spooner CH, Ducharme FM, Bretzlaff JA, Bota GW. Corticosteroids for preventing relapse following acute exacerbations of asthma. Cochrane Database Syst Rev 2007;CD000195. 200. Shrestha M, Bidadi K, Gourlay S, Hayes J. Continuous vs intermittent albuterol, at high and low doses, in the treatment of severe acute asthma in adults. Chest 1996;110:42-7. 201. Lin RY, Sauter D, Newman T, Sirleaf J, Walters J, Tavakol M. Continuous versus intermittent albuterol nebulization in the treatment of acute asthma. Ann Emerg Med 1993;22:1847-53. 202. Fitzgerald JM, Baynham R, Powles AC. Use of oxygen therapy for adult patients outside the critical care areas of a university hospital. Lancet 1988;1:981-3. 203. Rowe BH, Spooner CH, Ducharme FM, Bretzlaff JA, Bota GW. Corticosteroids for preventing relapse following acute exacerbations of asthma. Cochrane Database Syst Rev 2007;CD000195. 204. Masoli M, Fabian D, Holt S, Beasley R, Global Initiative for Asthma P. The global burden of asthma: Executive summary of the GINA Dissemination Committee report. Allergy 2004;59:469-78. 205. Edmonds ML, Camargo CA, Jr., Pollack CV, Jr., Rowe BH. Early use of inhaled corticosteroids in the emergency department treatment of acute asthma. Cochrane Database Syst Rev 2003;CD002308. 206. van den Akker-van Marle ME, Bruil J, Detmar SB. Evaluation of cost of disease: Assessing the burden to society of asthma in children in the European Union. Allergy 2005;60:140-9. 207. Denlinger LC, Sorkness CA, Chinchilli VM, Lemanske RF, Jr. Guideline-defining asthma clinical trials of the National Heart, Lung, and Blood Institute's Asthma Clinical Research Network and Childhood Asthma Research and Education Network. J Allergy Clin Immunol 2007;119:3-11;quiz 12-3. 208. Pedersen SE, Hurd SS, Lemanske RF, Jr., Becker A, Zar HJ, Sly PD, et al. 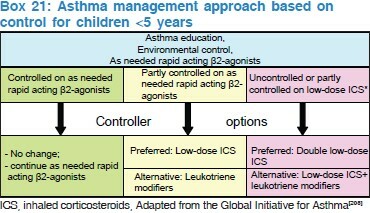 Global strategy for the diagnosis and management of asthma in children 5 years and younger. 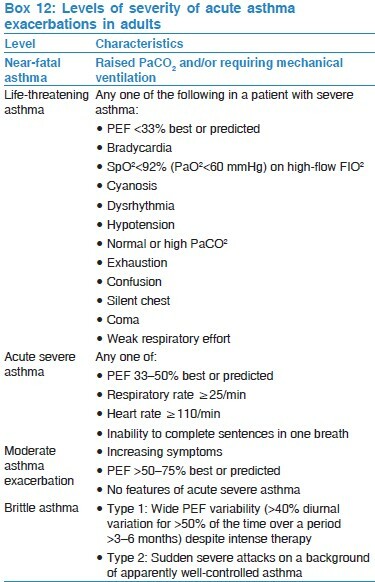 Pediatr Pulmonol 2011;46:1-17. 209. Glauber JH, Fuhlbrigge AL, Finkelstein JA, Homer CJ, Weiss ST. Relationship between asthma medication and antibiotic use. Chest 2001;120:1485-92. 210. Seear M, Wensley D, West N. How accurate is the diagnosis of exercise induced asthma among Vancouver schoolchildren? Arch Dis Child 2005;90:898-902. 211. Fahy JV, O'Byrne PM. "Reactive airways disease". A lazy term of uncertain meaning that should be abandoned. Am J Respir Crit Care Med 2001;163:822-3. 212. Weinberger M. Pediatric asthma and related allergic and nonallergic diseases: Patient-oriented evidence-based essentials that matter. Pediatric Health 2008;2:631-50. 213. Martinez FD, Wright AL, Taussig LM, Holberg CJ, Halonen M, Morgan WJ. Asthma and wheezing in the first six years of life. The Group Health Medical Associates. N Engl J Med 1995;332:133-8. 214. Just J, Gouvis-Echraghi R, Couderc R, Guillemot-Lambert N, Saint-Pierre P. Novel severe wheezy young children phenotypes: Boys atopic multiple-trigger and girls nonatopic uncontrolled wheeze. J Allergy Clin Immunol 2012;130:103-10. e8. 215. Guilbert TW, Morgan WJ, Zeiger RS, Bacharier LB, Boehmer SJ, Krawiec M, et al. Atopic characteristics of children with recurrent wheezing at high risk for the development of childhood asthma. J Allergy Clin Immunol 2004;114:1282-7. 216. Castro-Rodriguez JA. 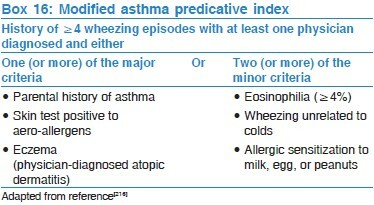 The Asthma Predictive Index: A very useful tool for predicting asthma in young children. J Allergy Clin Immunol 2010;126:212-6. 217. Yawn BP, Brenneman SK, Allen-Ramey FC, Cabana MD, Markson LE. Assessment of asthma severity and asthma control in children. Pediatrics 2006;118:322-9. 218. Welsh EJ, Hasan M, Li P. Home-based educational interventions for children with asthma. Cochrane Database Syst Rev 2011;CD008469. 219. Wolf FM, Guevara JP, Grum CM, Clark NM, Cates CJ. Educational interventions for asthma in children. Cochrane Database Syst Rev. 2003;(1):CD000326. 220. Wood MR, Bolyard D. Making education count: The nurse's role in asthma education using a medical home model of care. J Pediatr Nurs 2011;26:552-8. 221. Becker A, Lemiere C, Berube D, Boulet LP, Ducharme FM, FitzGerald M, et al. Summary of recommendations from the Canadian Asthma Consensus guidelines, 2003 CMAJ 2005;173(6 Suppl):S3-11. 222. Cope SF, Ungar WJ, Glazier RH. International differences in asthma guidelines for children. Int Arch Allergy Immunol 2009;148:265-78. 223. Zeiger RS, Mellon M, Chipps B, Murphy KR, Schatz M, Kosinski M, et al. 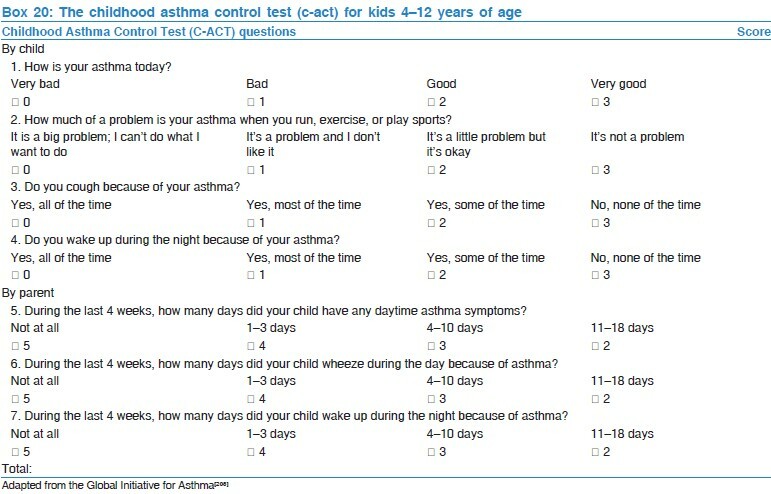 Test for Respiratory and Asthma Control in Kids (TRACK): Clinically meaningful changes in score. J Allergy Clin Immunol 2011;128:983-8. 224. Liu AH, Zeiger RS, Sorkness CA, Ostrom NK, Chipps BE, Rosa K, et al. The Childhood Asthma Control Test: Retrospective determination and clinical validation of a cut point to identify children with very poorly controlled asthma. J Allergy Clin Immunol 2010;126:267-73, 73 e1. 225. Murphy KR, Zeiger RS, Kosinski M, Chipps B, Mellon M, Schatz M, et al. 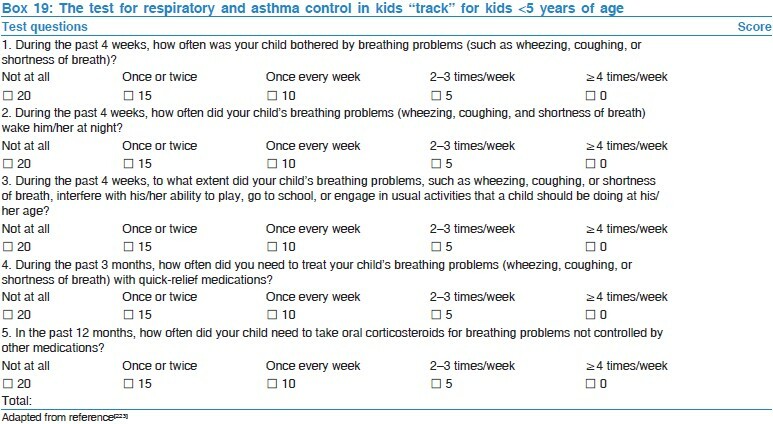 Test for respiratory and asthma control in kids (TRACK): A caregiver-completed questionnaire for preschool-aged children. J Allergy Clin Immunol 2009;123:833-9. e9. 226. Liu AH, Zeiger R, Sorkness C, Mahr T, Ostrom N, Burgess S, et al. Development and cross-sectional validation of the Childhood Asthma Control Test. J Allergy Clin Immunol 2007;119:817-25. 227. Bisgaard H, Allen D, Milanowski J, Kalev I, Willits L, Davies P. Twelve-month safety and efficacy of inhaled fluticasone propionate in children aged 1 to 3 years with recurrent wheezing. Pediatrics 2004;113:e87-94. 228. Leflein JG, Szefler SJ, Murphy KR, Fitzpatrick S, Cruz-Rivera M, Miller CJ, et al. Nebulized budesonide inhalation suspension compared with cromolyn sodium nebulizer solution for asthma in young children: Results of a randomized outcomes trial. Pediatrics 2002;109:866-72. 229. Dufour V, Millon L, Faucher JF, Bard E, Robinet E, Piarroux R, et al. Effects of a short-course of amoxicillin/clavulanic acid on systemic and mucosal immunity in healthy adult humans. Int Immunopharmacol 2005;5:917-28. 230. Hedlin G, Svedmyr J, Ryden AC. Systemic effects of a short course of betamethasone compared with high-dose inhaled budesonide in early childhood asthma. Acta Paediatr 1999;88:48-51. 231. Ducharme FM, Hicks GC. Anti-leukotriene agents compared to inhaled corticosteroids in the management of recurrent and/or chronic asthma in adults and children. Cochrane Database Syst Rev 2002:CD002314. 232. Phipatanakul W, Cronin B, Wood RA, Eggleston PA, Shih MC, Song L, et al. Effect of environmental intervention on mouse allergen levels in homes of inner-city Boston children with asthma. Ann Allergy Asthma Immunol 2004;92:420-5. 233. Ducharme FM. Anti-leukotrienes as add-on therapy to inhaled glucocorticoids in patients with asthma: Systematic review of current evidence. BMJ 2002;324:1545. 234. Simons FE, Villa JR, Lee BW, Teper AM, Lyttle B, Aristizabal G, et al. Montelukast added to budesonide in children with persistent asthma: A randomized, double-blind, crossover study. J Pediatr 2001;138:694-8. 235. Hakim F, Vilozni D, Adler A, Livnat G, Tal A, Bentur L. The effect of montelukast on bronchial hyperreactivity in preschool children. Chest 2007;131:180-6. 236. de Benedictis FM, del Giudice MM, Forenza N, Decimo F, de Benedictis D, Capristo A. Lack of tolerance to the protective effect of montelukast in exercise-induced bronchoconstriction in children. Eur Respir J 2006;28:291-5. 237. Lazarus SC, Boushey HA, Fahy JV, Chinchilli VM, Lemanske RF, Jr., Sorkness CA, et al. Long-acting beta2-agonist monotherapy vs continued therapy with inhaled corticosteroids in patients with persistent asthma: A randomized controlled trial. JAMA 2001;285:2583-93. 238. Shrewsbury S, Pyke S, Britton M. Meta-analysis of increased dose of inhaled steroid or addition of salmeterol in symptomatic asthma (MIASMA). BMJ 2000;320:1368-73. 239. Matz J, Emmett A, Rickard K, Kalberg C. Addition of salmeterol to low-dose fluticasone versus higher-dose fluticasone: An analysis of asthma exacerbations. J Allergy Clin Immunol 2001;107:783-9. 240. Everard ML, Bara A, Kurian M, Elliott TM, Ducharme F, Mayowe V. Anticholinergic drugs for wheeze in children under the age of two years. Cochrane Database Syst Rev 2005:CD001279. 241. Castro-Rodriguez JA, Rodrigo GJ. beta-agonists through metered-dose inhaler with valved holding chamber versus nebulizer for acute exacerbation of wheezing or asthma in children under 5 years of age: A systematic review with meta-analysis. J Pediatr 2004;145:172-7. 242. Deerojanawong J, Manuyakorn W, Prapphal N, Harnruthakorn C, Sritippayawan S, Samransamruajkit R. Randomized controlled trial of salbutamol aerosol therapy via metered dose inhaler-spacer vs. jet nebulizer in young children with wheezing. Pediatr Pulmonol 2005;39:466-72. 243. Agertoft L, Pedersen S. Importance of training for correct Turbuhaler use in preschool children. Acta Paediatr 1998;87:842-7. 244. Drblik S, Lapierre G, Thivierge R, Turgeon J, Gaudreault P, Cummins-McManus B, et al. Comparative efficacy of terbutaline sulphate delivered by Turbuhaler dry powder inhaler or pressurised metered dose inhaler with Nebuhaler spacer in children during an acute asthmatic episode. Arch Dis Child 2003;88:319-23. 245. Ducharme FM, Chalut D, Plotnick L, Savdie C, Kudirka D, Zhang X, et al. The Pediatric Respiratory Assessment Measure: A valid clinical score for assessing acute asthma severity from toddlers to teenagers. J Pediatr 2008;152:476-80, 480.e1. 246. Birken CS, Parkin PC, Macarthur C. Asthma severity scores for preschoolers displayed weaknesses in reliability, validity, and responsiveness. J Clin Epidemiol 2004;57:1177-81. 247. Parkin PC, Macarthur C, Saunders NR, Diamond SA, Winders PM. Development of a clinical asthma score for use in hospitalized children between 1 and 5 years of age. J Clin Epidemiol 1996;49:821-5. 248. Bentur L, Kerem E, Canny G, Reisman J, Schuh S, Stein R, et al. Response of acute asthma to a beta 2 agonist in children less than two years of age. Ann Allergy 1990;65:122-6. 249. Wennergren G, Engstrom I, Bjure J. Transcutaneous oxygen and carbon dioxide levels and a clinical symptom scale for monitoring the acute asthmatic state in infants and young children. Acta Paediatr Scand 1986;75:465-9. 250. Tal A, Bavilski C, Yohai D, Bearman JE, Gorodischer R, Moses SW. Dexamethasone and salbutamol in the treatment of acute wheezing in infants. Pediatrics 1983;71:13-8. 251. Bentur L, Canny GJ, Shields MD, Kerem E, Schuh S, Reisman JJ, et al. Controlled trial of nebulized albuterol in children younger than 2 years of age with acute asthma. Pediatrics 1992;89:133-7. 252. Tal A, Levy N, Bearman JE. Methylprednisolone therapy for acute asthma in infants and toddlers: A controlled clinical trial. Pediatrics 1990;86:350-6. 253. Chalut DS, Ducharme FM, Davis GM. The Preschool Respiratory Assessment Measure (PRAM): A responsive index of acute asthma severity. J Pediatr 2000;137:762-8. 254. Norton SP, Pusic MV, Taha F, Heathcote S, Carleton BC. Effect of a clinical pathway on the hospitalisation rates of children with asthma: A prospective study. Arch Dis Child 2007;92:60-6. 255. Lougheed MD, Olajos-Clow JG. Asthma care pathways in the emergency department. Curr Opin Allergy Clin Immunol 2010;10:181-7. 256. Browne GJ, Giles H, McCaskill ME, Fasher BJ, Lam LT. The benefits of using clinical pathways for managing acute paediatric illness in an emergency department. J Qual Clin Pract 2001;21:50-5. 257. Alberta Health Services, Pediatric Asthma Pathways. Available from: http://www.ucalgary.ca/icancontrolasthma/pathwayall. [Last accessed on 2012 Sep 16]. 258. Johnson KB, Blaisdell CJ, Walker A, Eggleston P. Effectiveness of a clinical pathway for inpatient asthma management. Pediatrics 2000;106:1006-12. 259. Dicpinigaitis PV. Angiotensin-converting enzyme inhibitor-induced cough: ACCP evidence-based clinical practice guidelines. Chest 2006;129(1 Suppl):169S-73S. 260. Dicpinigaitis PV. Chronic cough due to asthma: ACCP evidence-based clinical practice guidelines. Chest 2006;129(1 Suppl):75S-9S. 261. Morice AH, McGarvey L, Pavord I, British Thoracic Society Cough Guideline G. Recommendations for the management of cough in adults. Thorax 2006;61 Suppl 1:i1-24. 262. Sears MR, Lotvall J. Past, present and future--beta2-adrenoceptor agonists in asthma management. J Pediatr 2000;137:762-8. 263. Szczeklik A, Stevenson DD. Aspirin-induced asthma: Advances in pathogenesis, diagnosis, and management. J Allergy Clin Immunol 2003;111:913-21;quiz 922. 264. Stevenson DD. Diagnosis, prevention, and treatment of adverse reactions to aspirin and nonsteroidal anti-inflammatory drugs. J Allergy Clin Immunol 1984;74(4 Pt 2):617-22. 265. Al-Asoom LI, Al-Rubaish A, Al-Quorain AA, Qutub H, El-Munshid HA. The association of gastroesophageal reflux with bronchial asthma. Can asthma also trigger reflux? Hepatogastroenterology 2006;53:64-72. 266. Bresci G, Sacco R. Pulmonary or otolaryngologic extraesophageal manifestations in patients with gastroesophageal reflux disease. World J Gastrointest Endosc 2010;2:47-9. 267. Gaude GS. Pulmonary manifestations of gastroesophageal reflux disease. Ann Thorac Med 2009;4:115-23. 268. Champion GL, Richter JE. Atypical presentation of gastroesophageal reflux disease: Chest pain, pulmonary, and ear, nose, throat manifestations. Gastroenterologist 1993;1:18-33. 269. Asano K, Suzuki H. Silent acid reflux and asthma control. N Engl J Med 2009;360:1551-3. 270. Namazy JA, Schatz M. Pregnancy and asthma: Recent developments. Curr Opin Pulm Med 2005;11:56-60. 271. Schatz M, Harden K, Forsythe A, Chilingar L, Hoffman C, Sperling W, et al. The course of asthma during pregnancy, post partum, and with successive pregnancies: A prospective analysis. J Allergy Clin Immunol 1988;81:509-17. 272. Murphy VE, Gibson PG, Smith R, Clifton VL. Asthma during pregnancy: Mechanisms and treatment implications. Eur Respir J 2005;25:731-50. 273. Hanania NA, Belfort MA. Acute asthma in pregnancy. Crit Care Med 2005;33(10 Suppl):S319-24. 274. Rahimi R, Nikfar S, Abdollahi M. Meta-analysis finds use of inhaled corticosteroids during pregnancy safe: A systematic meta-analysis review. Hum Exp Toxicol 2006;25:447-52. 275. Wendel PJ, Ramin SM, Barnett-Hamm C, Rowe TF, Cunningham FG. Asthma treatment in pregnancy: A randomized controlled study. Am J Obstet Gynecol 1996;175:150-4. 276. Lao TT, Huengsburg M. Labour and delivery in mothers with asthma. Eur J Obstet Gynecol Reprod Biol 1990;35:183-90. 277. Fitzsimons R, Greenberger PA, Patterson R. Outcome of pregnancy in women requiring corticosteroids for severe asthma. J Allergy Clin Immunol 1986;78:349-53. 278. Perlow JH, Montgomery D, Morgan MA, Towers CV, Porto M. Severity of asthma and perinatal outcome. Am J Obstet Gynecol 1992;167(4 Pt 1):963-7. 279. Currie GP, Douglas JG, Heaney LG. Difficult to treat asthma in adults. BMJ 2009;338:b494. 280. Sullivan SD, Rasouliyan L, Russo PA, Kamath T, Chipps BE, Group TS. Extent, patterns, and burden of uncontrolled disease in severe or difficult-to-treat asthma. Allergy 2007;62:126-33. 281. Serra-Batlles J, Plaza V, Morejon E, Comella A, Brugues J. Costs of asthma according to the degree of severity. Eur Respir J 1998;12:1322-6. 282. Chen H, Blanc PD, Hayden ML, Bleecker ER, Chawla A, Lee JH, et al. Assessing productivity loss and activity impairment in severe or difficult-to-treat asthma. Value Health 2008;11:231-9. 283. Lee JH, Haselkorn T, Borish L, Rasouliyan L, Chipps BE, Wenzel SE. Risk factors associated with persistent airflow limitation in severe or difficult-to-treat asthma: Insights from the TENOR study. Chest 2007;132:1882-9. 284. Sturdy PM, Victor CR, Anderson HR, Bland JM, Butland BK, Harrison BD, et al. Psychological, social and health behaviour risk factors for deaths certified as asthma: A national case-control study. Thorax 2002;57:1034-9. 285. Butler C, Heaney LG. Risk factors of frequent exacerbations in difficult-to-treat asthma. Eur Respir J. 2006;27:1324-5. 286. Gaga M, Papageorgiou N, Yiourgioti G, Karydi P, Liapikou A, Bitsakou H, et al. Risk factors and characteristics associated with severe and difficult to treat asthma phenotype: An analysis of the ENFUMOSA group of patients based on the ECRHS questionnaire. Clin Exp Allergy 2005;35:954-9. 287. Sullivan SD, Wenzel SE, Bresnahan BW, Zheng B, Lee JH, Pritchard M, et al. Association of control and risk of severe asthma-related events in severe or difficult-to-treat asthma patients. Allergy 2007;62:655-60. 288. Robinson DS, Campbell DA, Durham SR, Pfeffer J, Barnes PJ, Chung KF, et al. 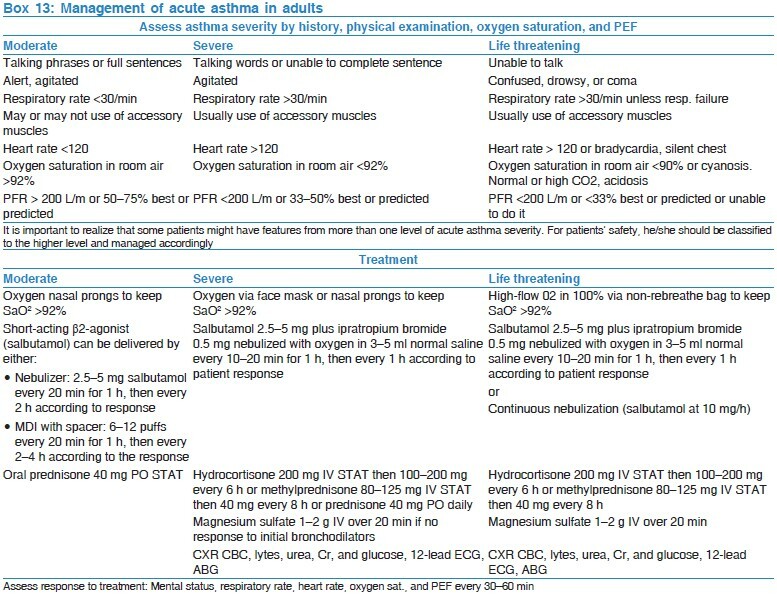 Systematic assessment of difficult-to-treat asthma. Eur Respir J 2003;22:478-83. 289. Jani AL, Hamilos DL. Current thinking on the relationship between rhinosinusitis and asthma. J Asthma 2005;42:1-7. 290. Heaney LG, Brightling CE, Menzies-Gow A, Stevenson M, Niven RM; British Thoracic Society Difficult Asthma Network. Refractory asthma in the UK: Cross-sectional findings from a UK multicentre registry. Thorax 2010;65:787-94. 291. Adcock IM, Lane SJ, Brown CR, Peters MJ, Lee TH, Barnes PJ. Differences in binding of glucocorticoid receptor to DNA in steroid-resistant asthma. J Immunol. 1995;154:3500-5. 292. Ayres JG. Pseudo-steroid resistant asthma. Thorax 1999;54:956. 293. Thomas PS, Geddes DM, Barnes PJ. Pseudo-steroid resistant asthma. Thorax 1999;54:352-6. 294. Roberts NJ, Robinson DS, Partridge MR. How is difficult asthma managed. Eur Respir J 2006;28:968-73. 295. Smits W, Letz K. Managing difficult-to-treat asthma: Lessons from a center of excellence in allergy and asthma care. J Med Pract Manage 2007;22:350-8. 296. Storms W, Bowdish MS, Farrar JR. Omalizumab and asthma control in patients with moderate-to-severe allergic asthma: A 6-year pragmatic data review. Allergy Asthma Proc 2012;33:172-7. 297. Campbell JD, Blough DK, Sullivan SD. Comparison of guideline-based control definitions and associations with outcomes in severe or difficult-to-treat asthma. Ann Allergy Asthma Immunol 2008;101:474-81. 298. Haldar P, Brightling CE, Hargadon B, Gupta S, Monteiro W, Sousa A, et al. Mepolizumab and exacerbations of refractory eosinophilic asthma. N Engl J Med 2009;360:973-84. 299. Pavord ID, Cox G, Thomson NC, Rubin AS, Corris PA, Niven RM, et al. Safety and efficacy of bronchial thermoplasty in symptomatic, severe asthma. Am J Respir Crit Care Med. 2007;176:1185-91. 300. Michaud G, Ernst A. Counterpoint: Efficacy of bronchial thermoplasty for patients with severe asthma. Is there sufficient evidence? Not yet. Chest 2011;140:576-7;discussion 577. 301. Shifren A, Chen A, Castro M. Point: Efficacy of bronchial thermoplasty for patients with severe asthma. Is there sufficient evidence? Yes. Chest 2011;140:573-5;discussion 578. 302. Wu Q, Xing Y, Zhou X, Wang D. Meta-analysis of the efficacy and safety of bronchial thermoplasty in patients with moderate-to-severe persistent asthma. J Int Med Res 2011;39:10-22. 303. Standardization of Spirometry, 1994 Update. American Thoracic Society. Am J Respir Crit Care Med 1995;152:1107-36. Authors of Document Al-Dorzi, H., Al-Shammary, H., Al-Shareef, S., (...), Al Dawood, A., Arabi, Y.